In addition to this FLAG website RAF Leeming has three social media sites on the web. Station Executive Officers and Civic Dignitaries marked the Change of Command at RAF Leeming, with Air Commodore David Arthurton OBE handing over to Group Captain Blythe Crawford OBE. Air Commodore David Arthurton said: “My tour here has gone in the blink of an eye. I have thoroughly enjoyed the past two years and will leave with lots of fond memories. The operational output has been fantastic, the Station is constantly busy. "The highlight for me was RAF 100 and the support provided from the whole force to all the major events. Throughout the centenary period we have been able to celebrate in many of the wonderful towns that surround the Station and the degree of support received from the community has amazed me." 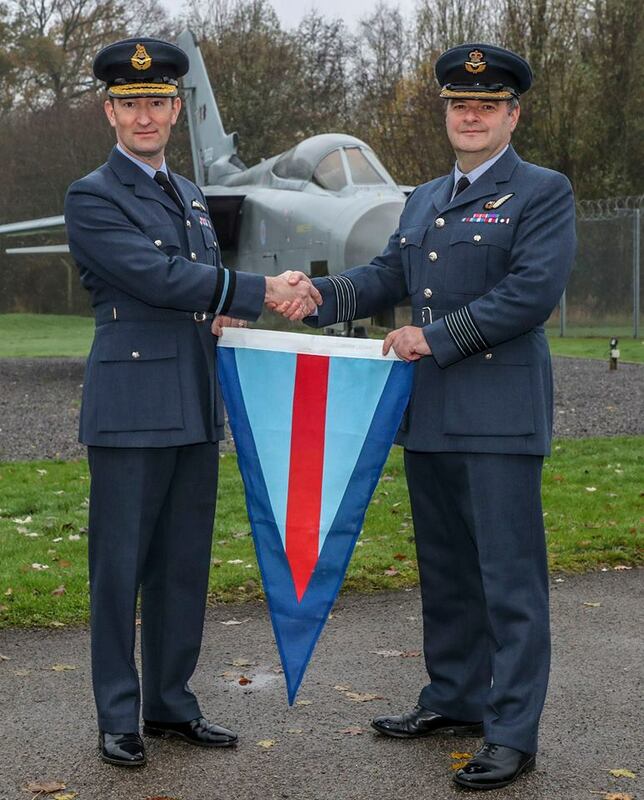 Air Commodore Arthurton presented the Station Commander's pennant to Group Captain Crawford, who arrives at RAF Leeming from Washington, where he served within the US Air Force’s Strategic Studies Group. Formerly a Navigator on XXV(F) Squadron, he has served two previous tours at RAF Leeming. Excited to be back in North Yorkshire he said: “I have been following RAF Leeming on social media for quite a while and the high regard in which the local Community and the station hold each other is very clear. I am really looking forward to working with a fantastic array of people." 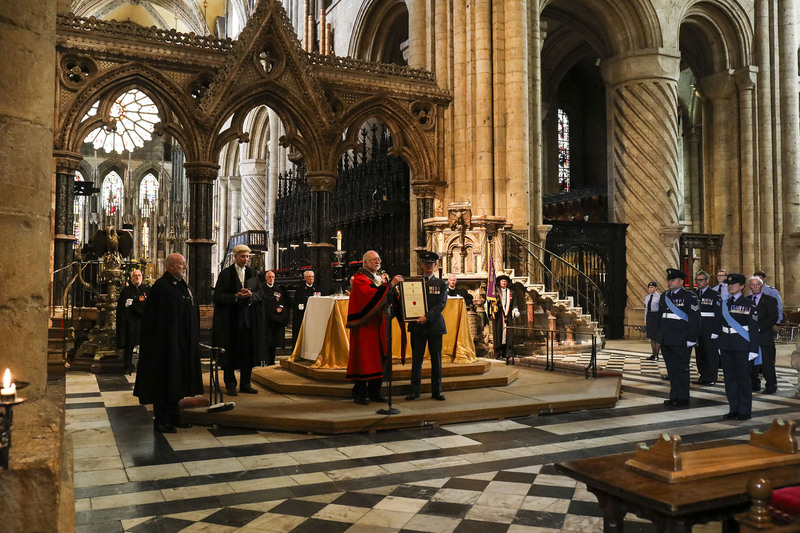 The North-East marked the Royal Air Force centenary with a spectacular day of events starting in Newcastle with a train naming ceremony, followed by a Spitfire flypast and a parade in the historic city of Durham. 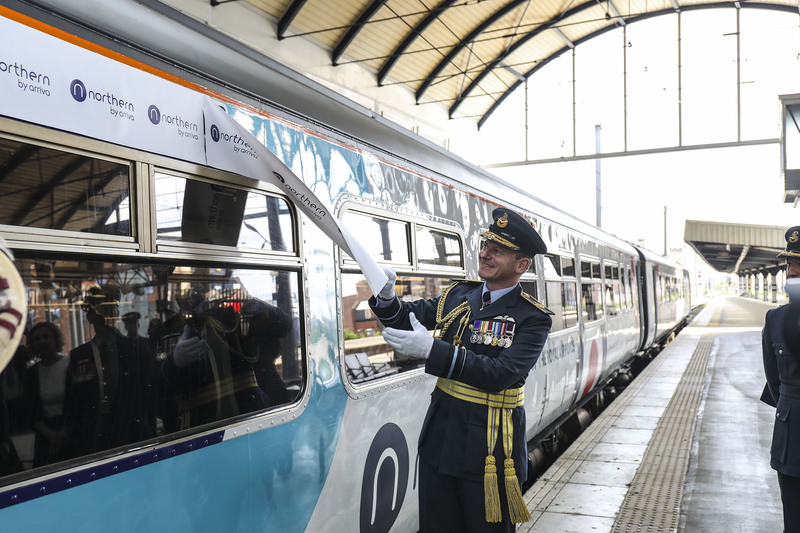 The event co-ordinated by the Reserve Forces and Cadet Association (RFCA) for the North of England began at Newcastle Train Station with Assistant Chief of the Air Staff, Air Vice Marshall Mike Wigston unveiling the name of a new Northern Rail train, ‘The Spirit of the Royal Air Force’. 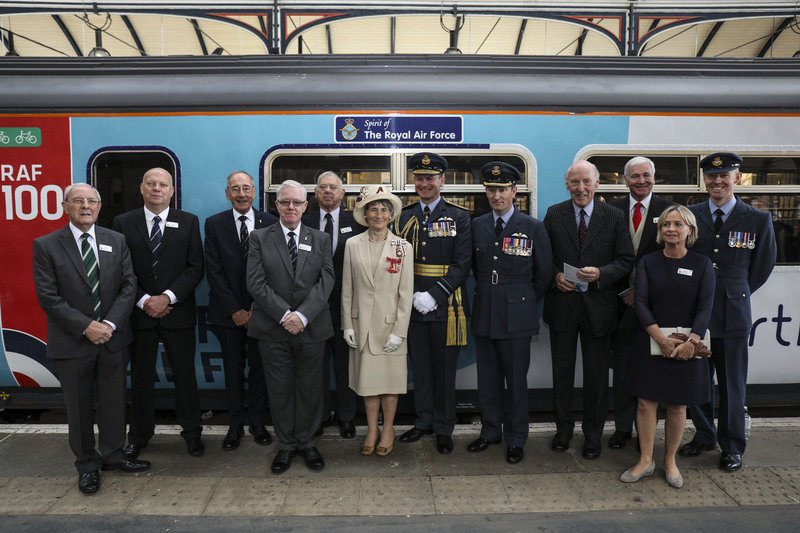 The train was boarded and travelled to Durham with the Lord Lieutenants of Durham and Tyne and Wear, dignitaries, the Station Commanders of RAF Leeming and RAF Boulmer and Air Cadets from across the region. Air Vice Marshall Mike Wigston and guests were greeted by an Air Training Corps guard of honour and a commemorative Spitfire flypast as they arrived at Durham Train Station, before continuing to the Cathedral for a service, during which 607 (County of Durham) Squadron, Royal Auxiliary Air Force was awarded the Freedom of the City by the Mayor of Durham. Following the service of thanksgiving, spectators of all ages gathered on Palace Green to watch the 550-strong RAF100 parade, which was led by the Durham/Northumberland Wing Band. The parade culminated in an inspection, salute and march past observed by the VIP guests. 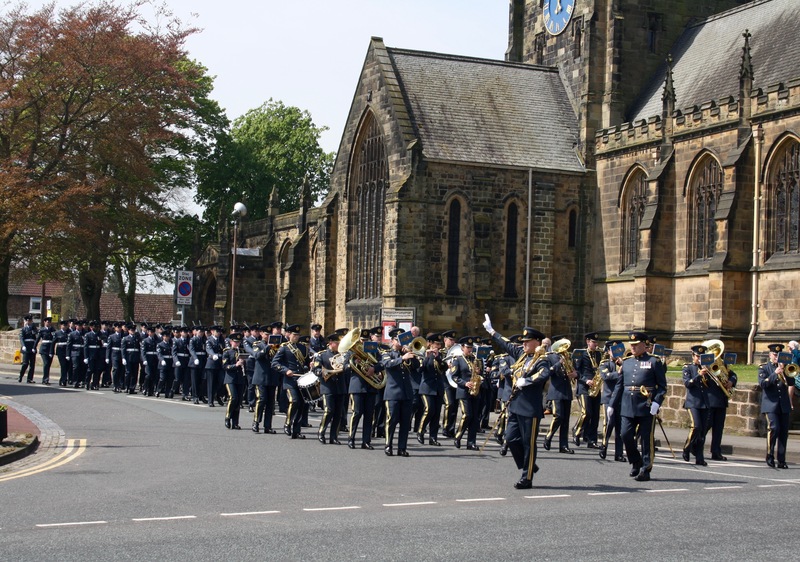 Among the cadets taking part were Rebecca Leitch, 15, from 2344 (Longbenton) Squadron, who gave a reading as part of the service of thanksgiving, and Wing Band member, Evie Panvalkar, 15, from 346 (Tynemouth) Squadron. 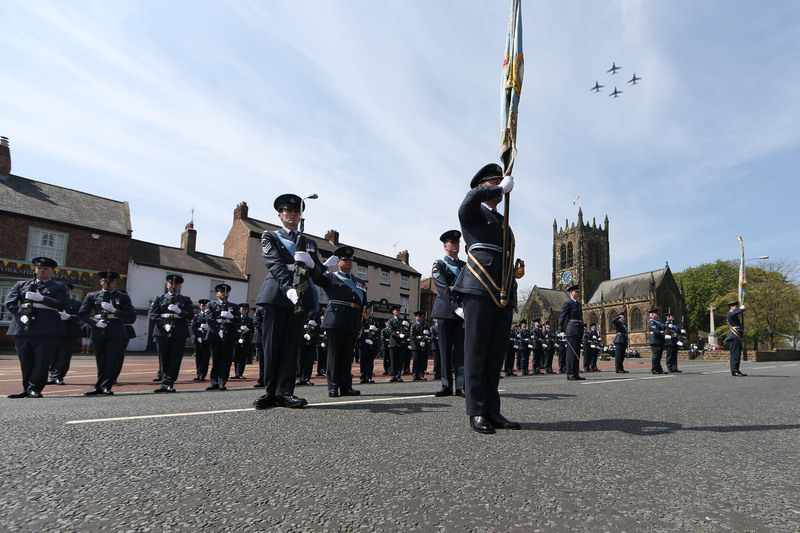 The sun shone on personnel from Royal Air Force Leeming as they paraded through Northallerton to the rousing sound of the Band of the Royal Air Force College in celebration of the Freedom of the County Town and 100 years of the RAF. 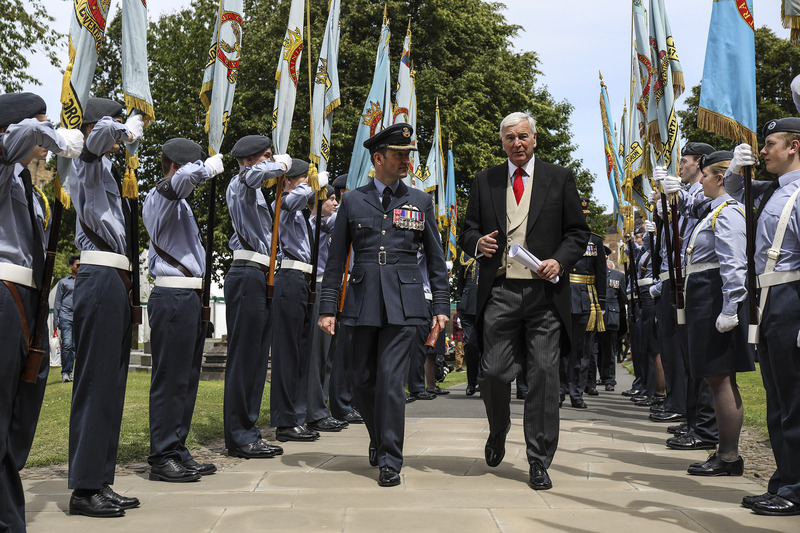 A crowd of veterans, school children and the local community turned out in force for the very special event which was a celebration of RAF Leeming’s longstanding close relationship with Northallerton. 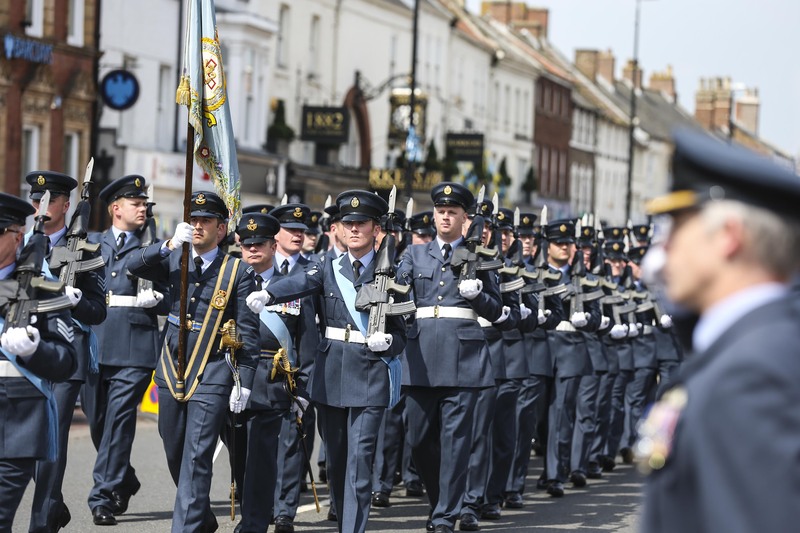 Although exercised regularly, this year’s parade through Northallerton with bayonets fixed was extra special as it took place in the 100th Year of the Royal Air Force. To mark the occasion, RAF Leeming units including 100 Squadron, the Mountain Rescue Team and 34 Squadron RAF Regiment had some of their equipment on display for visitors to learn more about the work of the diverse North Yorkshire station. RAF Leeming Station Commander, David Arthurton, was delighted with the turn-out. He said: “It’s been wonderful. We are very grateful to the Mayor of Northallerton for granting us permission to exercise our freedom of the town. Events like this are important – many of our personnel live in the town and we like to give something back. Cllr John Forrest, Mayor of Northallerton added: “It’s been fantastic. Our links go back many years, and the Station has had the Freedom of Northallerton for 40 years. As long as RAF Leeming is there, we will maintain our association with the RAF. 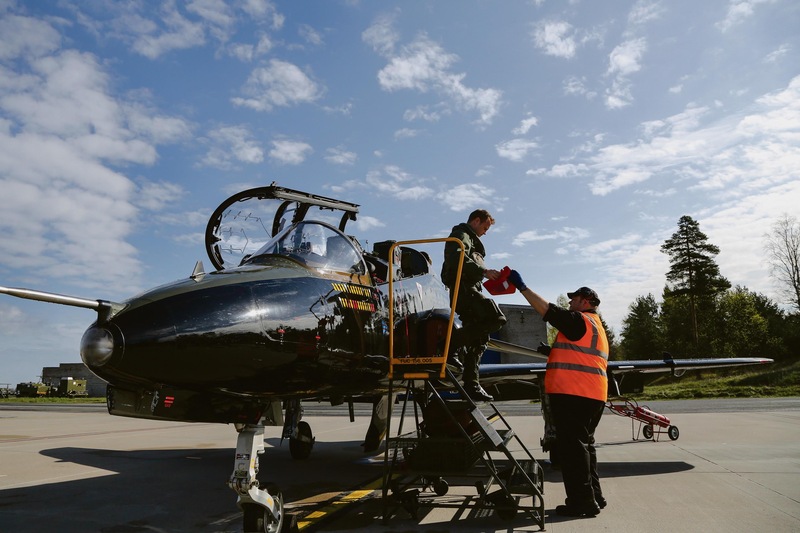 Both the Hungarian Chief of Air Staff, General Sáhár and Her Majesty’s Ambassador to Hungary, Iain Lyndsay OBE flew as passengers in 100 Sqn Hawk. 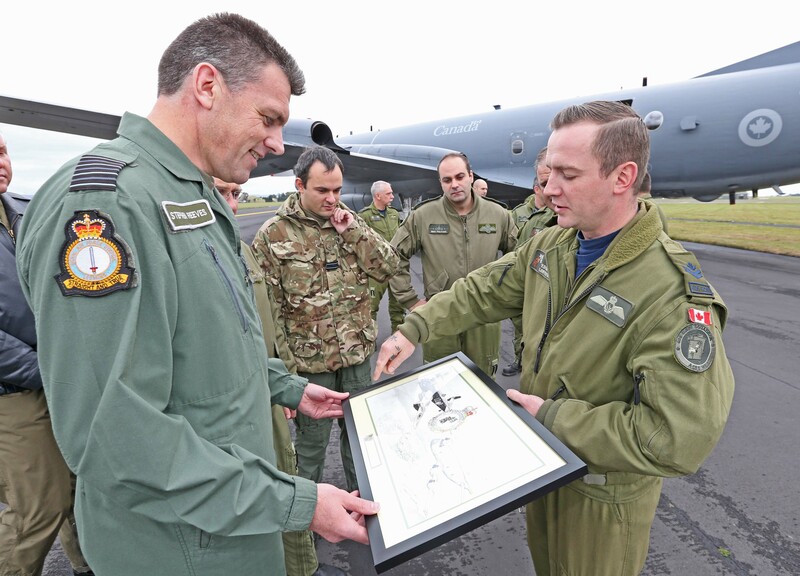 The Ambassador was later presented with an EXERCISE CARPARTHIAN HAWK print by Wing Commander Nick Badel, Officer Commanding 100 Sqn. 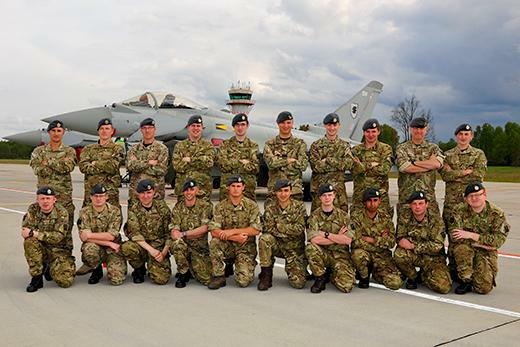 The exercise enabled personnel to carry out Air Combat Training and Air Combat Instructor work-ups whilst sharing UK/NATO training with Friendly Forces (Hungarian, Slovakian, Czech and Croatian Air Forces). York veteran Mr Douglas Petty received France’s highest military honour, the Legion d’Honneur, at an awards ceremony held at RAF Leeming. The French government granted D-Day veterans the award, as a way of honouring and thanking those who fought and risked their lives to secure France’s liberation during the Second World War. Douglas Petty, a former Flight Engineer on the famous Halifax and Lancaster bombers, served with Canadian 429 (Bison) Squadron Leeming during 1944 to 1945. 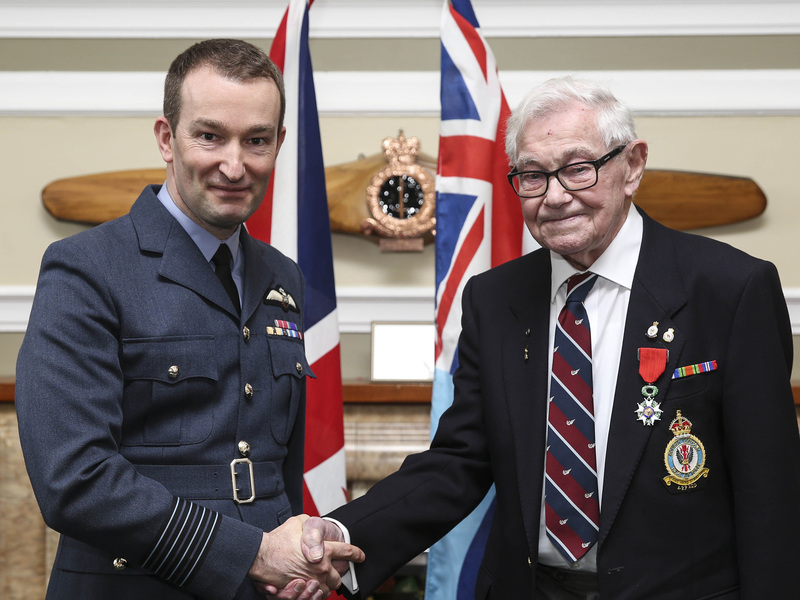 Mr Petty received a standing ovation from his family, friends and Station personnel as Group Captain David Arthurton OBE, Station Commander RAF Leeming awarded him with the distinguished Legion d’Honneur. Following the ceremony Doug spent time in Historical Training Facility, where he was able to show his family and friends just what life was like during his time here in the 1940’s. He also got to meet up with Flight Sergeant Mark Fellows, a Flight Engineer with the Battle of Britain Memorial Flight. They spent a considerable amount time talking about the Lancaster aircraft on which they both know very well. Mark Said: “Mr Petty and I spoke at length about the Lancaster engines and fuel system, and I can safely say I learned a lot more from him than he did from me! This fascinating man recounted events as if they were yesterday, and I was absolutely captivated. “Bomber Command Veterans are characteristically unassuming gentlemen, who have spent years as unsung heroes; as a result they are difficult to ‘capture’. But now I have found Doug, he will be welcomed into the BBMF family, and has the opportunity to attend the various veterans’ events we hold throughout the year. Mr Petty is a lucky man to have survived – 55,573 of his Bomber Command – comrades were not so fortunate – ‘Lest We Forget’. 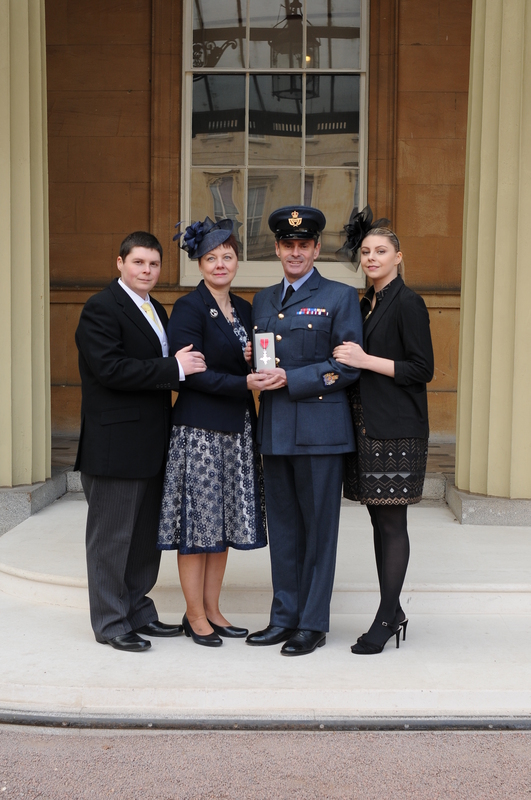 Leeming Officer's achievements are recognised by his investiture with the M.B.E. It gives FLAG great pleasure to announce that our FLAG 2 OIC, W.O. Derek McDonough, was invested with the M.B.E. by H.R.H. The Prince of Wales, recognising more than 30 years of outstanding service in the Royal Air Force. 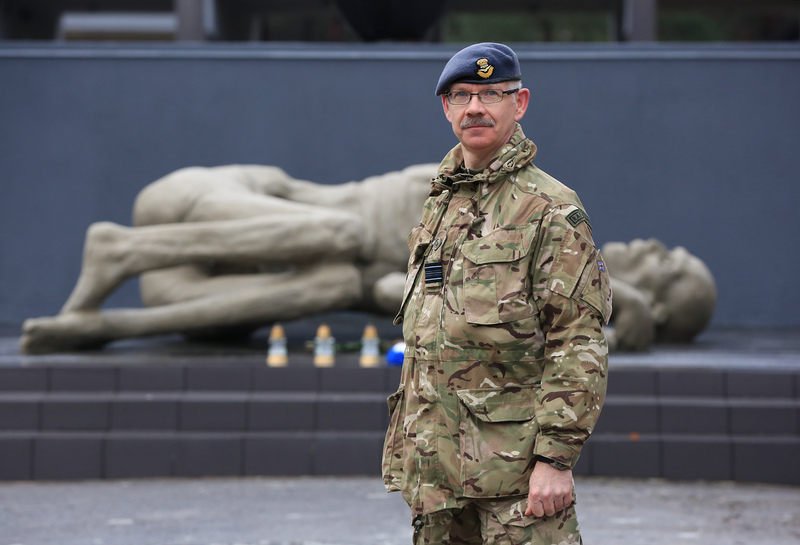 As well as providing exemplary service as RAF Leeming's Logistics Squadron Warrant Officer, Derek was a driving force in the regeneration and training of 135 Expeditionary Air Wing which deployed to Lithuania in support of Operation Azotize in 2012. More recently he was at the heart of the action during the Anglo-French Exercise Griffin Strike. In addition to his work duties Derek enthusiastically runs the Historical Training Facility as well devoting much time and effort to promoting FLAG at Leeming and organising our FLAG events. On behalf of everyone in FLAG we congratulate Derek on such a well deserved award. can be read in the RAF News section of the RAF Zone page on our website or by following this weblink. An RAF Leeming serviceman stood proud in his dress uniform to be commended for his devotion to the service, and in particular his charity efforts whilst undergoing treatment for terminal colon cancer. 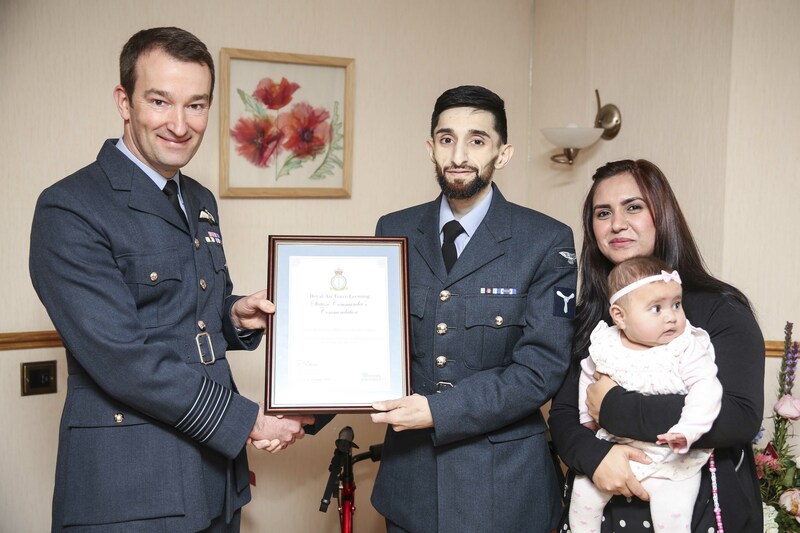 Despite months of gruelling treatment, Senior Aircraftman Shahbaz Saleem polished his own shoes to make sure that every detail on his uniform was perfect for the presentation of a Station Commander’s Commendation. The moving occasion with family and friends was held at Pendleside Hospice in Burnley, where ‘Shabz’ is receiving palliative care, and which he has described as ‘heaven on earth’. 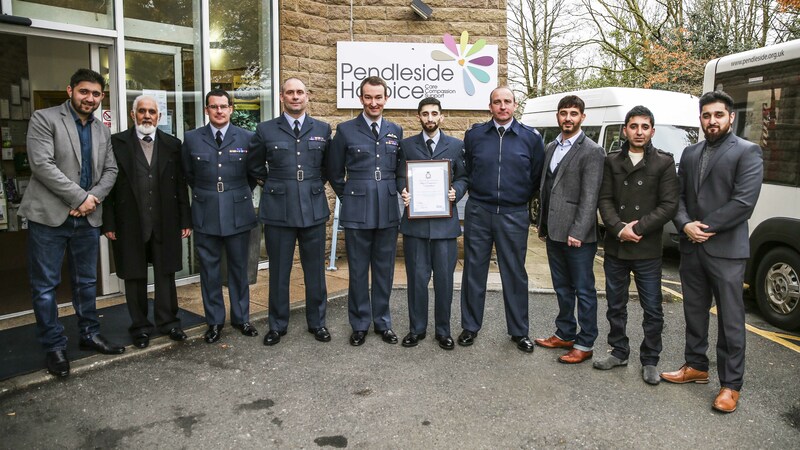 RAF Leeming Station Commander, Group Captain David Arthurton, presented the Commendation in recognition of SAC Saleem’s commitment to the Armed Forces Muslim Association since joining the RAF. He tirelessly worked to highlight the Royal Air Force in a positive manner, especially amongst his own Muslim community. Shabz has always committed time to charity work, including a Snowdon trek for the Free Spiritual Centre and inter-faith endeavours with the Pendle Homeless Café. But his determination to raise awareness of colon and bowel cancers in younger people since his diagnosis in October last year has been nothing short of inspirational. His wish to leave a legacy for the staff and volunteers who are caring for him and his family with dignified tenderness has moved hundreds of people from literally around the world to donate more than £12,000 to his JustGiving site in only two weeks. Shabz’s determination to raise awareness of colon cancer in young people so that others don’t have to go through the same experience continues to touch hearts internationally and overwhelm his family and colleagues. To date he has raised more than £13,000 for Pendleisde Hospice. His older brother Shahzad said: “I’m amazingly proud of what he has achieved and continues to achieve every day. It felt like the best day of my life. Shahbaz may be physically weaker but mentally, he is stronger than ever. Group Captain David Arthurton proudly presents SAC Saleem with his award together with his wife Anum and his youngest daughter Aisha. On Friday 25 November Group Captain David Bradshaw handed over command of RAF Leeming to Group Captain David Arthurton at an event attended by local Civic Dignitaries, friends of the station and unit personnel. 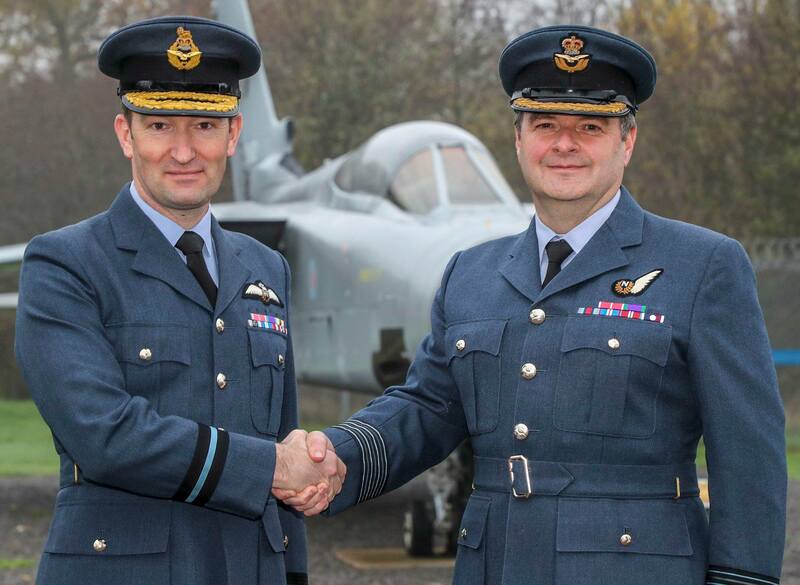 After two-years as Station Commander at RAF Leeming, Gp Capt Bradshaw leaves the unit promoted to Air Commodore as Lightning Force Commander, RAF Marham. 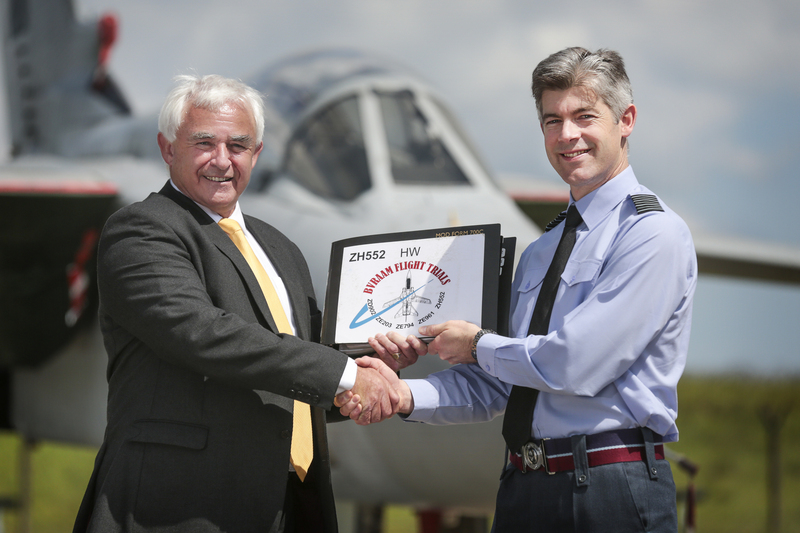 He said “There have been many highlights during my tenure at RAF Leeming. In particular; my role as Force Commander during Exercise Griffin Strike, receiving the Freedom of Ripon and being sponged in the face in front of the RAF Falcons at the Station Community and Families Day. Group Captain David Arthurton, originally from Harrogate and a former student of Northumbria University Air Squadron, arrives at RAF Leeming from Permanent Joint Headquarters (PJHQ). The Mayors of Bedale and Ripon and representatives from Northallerton Town Council were amongst the guests at the event. Gp Capt Bradshaw thanked them for the their continued support and reiterated how important it is to the Station to be considered part of the community. The Lord Lieutenant of North Yorkshire, Mr Barry Dodd, officially unveiled the Tornado F3 Gate Guardian before a small group of invited guests including FLAG representatives. After the ceremony a reception was held in the Officers Mess for the local community.The Station Commander, Group Captain David Bradshaw, delivered an address in which he thanked the community, including FLAG, for their continued support of RAF Leeming. Post reception a Sunset Parade was held followed by Hawks from 100 Squadron and a Spitfire from the BBMF giving a flying display in what was perfect evening weather. At the end of the display guests were taken to another area of the airfield where a role demonstration of air power took place. Elements of Leeming's RAF Regiment took the role of airfield defending blue forces supported by four 100 Squadron Hawks in a close air support role. Simulated Hawk attacks on the enemy were accompanied by ground explosions of ordnance laid by the regiment. It was an excellent evening enjoyed by all those attending and FLAG expresses thanks for the invite to attend. Photos by FLAG and Melissa Peakman. 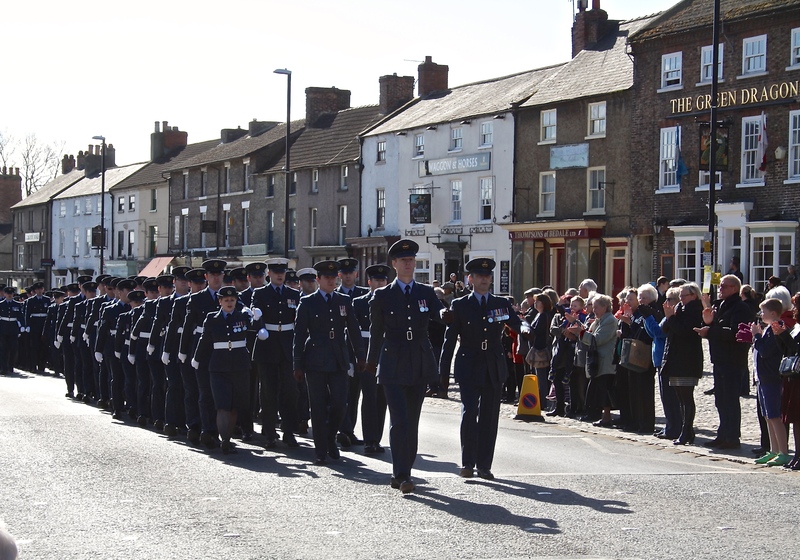 Glorious sunshine provided the perfect backdrop for RAF Leeming personnel as they celebrated their link with the local community at the Freedom of Northallerton Parade. 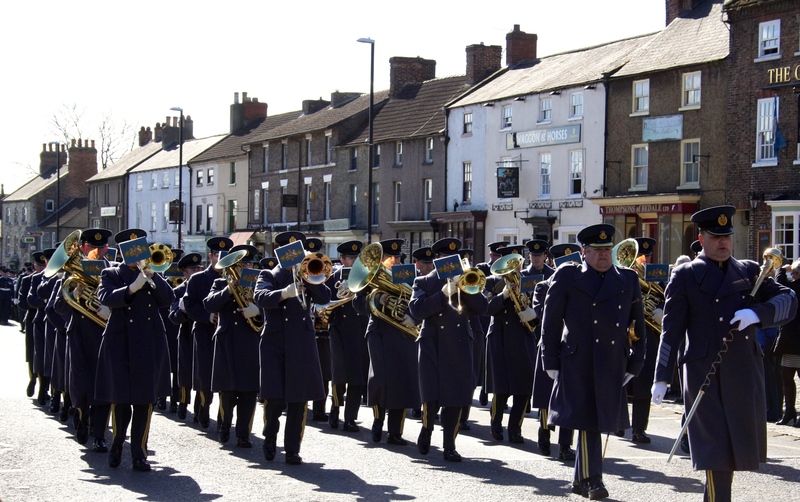 Station Personnel accompanied the Illuminated Address along Northallerton High Street to the rousing sound of the band of the Royal Air Force College. The event was marked with a flypast of four Hawk jets from 100 Squadron based at RAF Leeming. Personnel from RAF Leeming were at the hub of a major UK exercise involving thousands of personnel from the UK and French military. Exercise Griffin Strike built upon many years of UK-French cooperation. 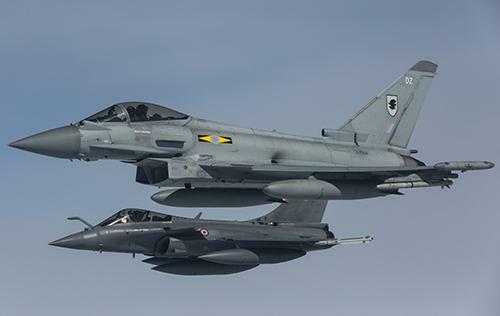 During the two week event, RAF Typhoon aircraft and French Air Force Rafale aircraft were flying from RAF Leeming in North Yorkshire, commanded by the UK-French Combined Joint Force Air Component Headquarters based at RAF High Wycombe. At the heart of the Exercise is 135 Combined Expeditionary Air Wing (EAW) – comprising RAF Leeming personnel permanently held at very high readiness to deploy wherever required across the globe and embedded French Personnel. Co-ordination of every operational need from catering and accommodation to welfare and logistics is the responsibility of EAW personnel. “We’re providing life support – if more personnel were needed we would staff that, or if anyone needed to get back to the UK for welfare reasons,” said one officer based within the ‘DRASH’ – or Deployed Rapid Assembly Shelter, a headquarters that can be quickly put-up for operations in literally any environment. 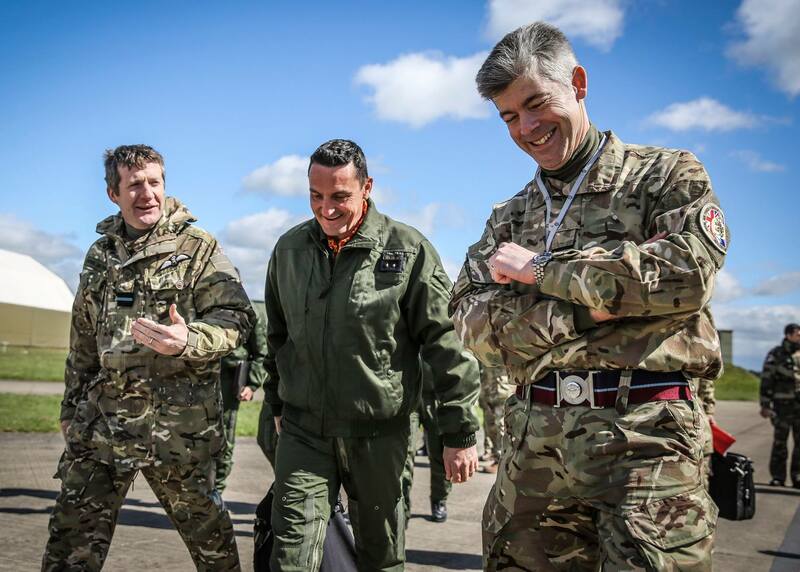 On Monday, the RAF Leeming-based element of Exercise Griffin Strike was visited by senior leaders from the Royal Air Force and French Air Force, who spoke of their pride in the two air forces’ close cooperation. The FAF’s head of air operations and air defence said cooperation between the two air forces was “in their DNA”. 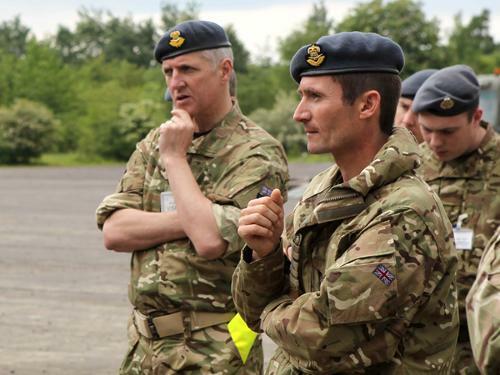 His RAF counterpart praised the allies’ work together on operations. 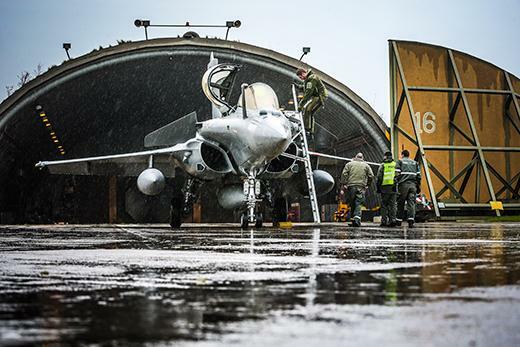 Above left - a Rafale C emerges from a Leeming HAS on a wet North Yorkshire day. Above right - 11 Sqn Typhoon and Rafale over the North Sea. Général de Brigade Aérienne Gilles Perron of the Armée De l'Air (left) and Air Commodore Johnny Stringer, Assistant Chief of Staff Operations, RAF, taking questions from the international press. Stn Cdr Gp Cpn David Bradshaw with Air Commodore Stringer and Général de Brigade Aérienne Gilles Perron. 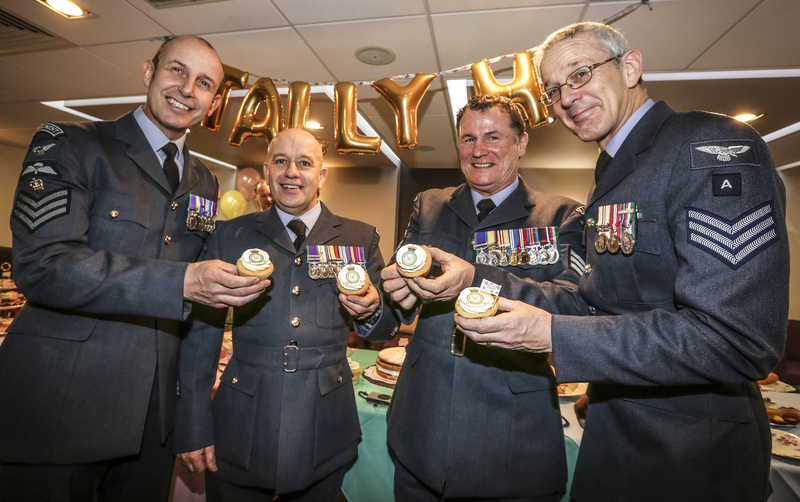 609 Sqn celebrates turning eight ‘O’ Tally Ho !! 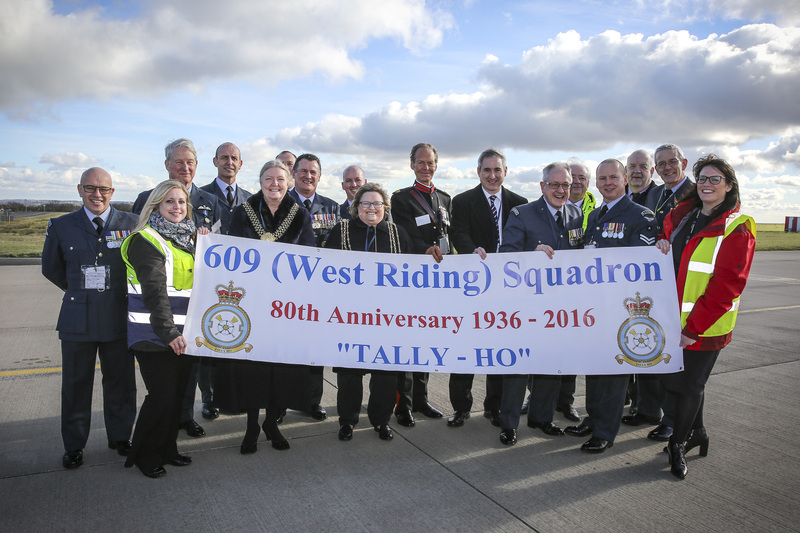 Serving personnel, West Yorkshire Dignitaries, Veterans and airport staff celebrated the 80th anniversary of 609 (West Riding) Squadron, Royal Auxiliary Air Force, at an event held at Leeds Bradford Airport. The squadron, based at RAF Leeming, was formed at RAF Yeadon, now Leeds Bradford Airport, in 1936 as a day bomber unit of the Auxiliary Air Force. In 1938 it was redesignated a fighter unit and by September 1939, on the outbreak of war, 609 was flying the superb Supermarine Spitfire. The majority of pilots and groundcrews were recruited from Leeds and the surrounding area. As the Battle of Britain grew in intensity through late July and into August of 1940, 609’s reputation spread. 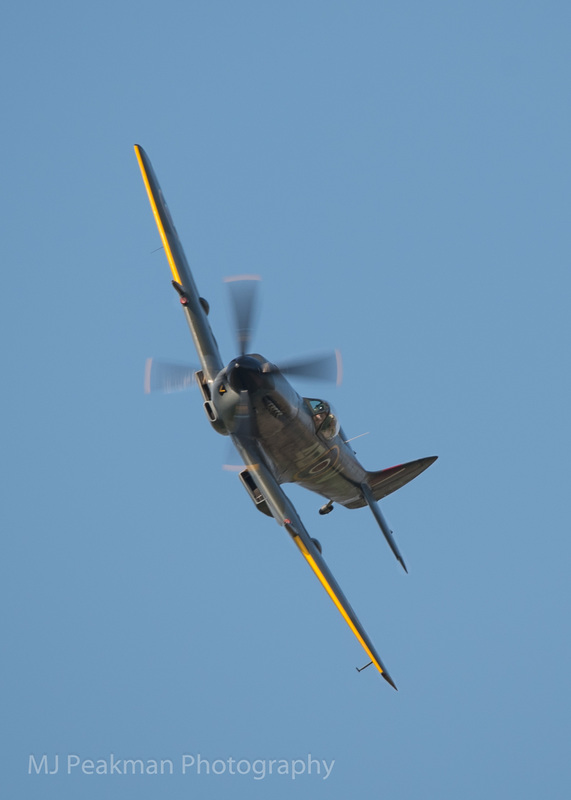 They were the first spitfire unit to destroy 100 enemy aircraft. By 1940,the original core of West Riding Auxiliary pilots had sadly been lost – the last being Flight Lieutenant John Dundas, an ace with at least 12 victories who was also a foreign correspondent with the Yorkshire Post in Leeds. Squadron members past and present attended the birthday celebrations, which included a vintage-style afternoon tea, as well as the chance to share stories and chat with local dignitaries including the Lord Mayor of Leeds and the Lord Mayor of Bradford. Following the speeches, guests were treated to a four ship fly past of Hawk jets from 100 Sqn – also based at RAF Leeming. 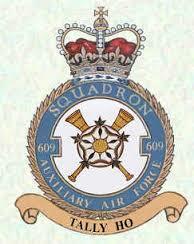 609 (WR) squadron is no longer a flying unit, but instead has the role of Force Protection. 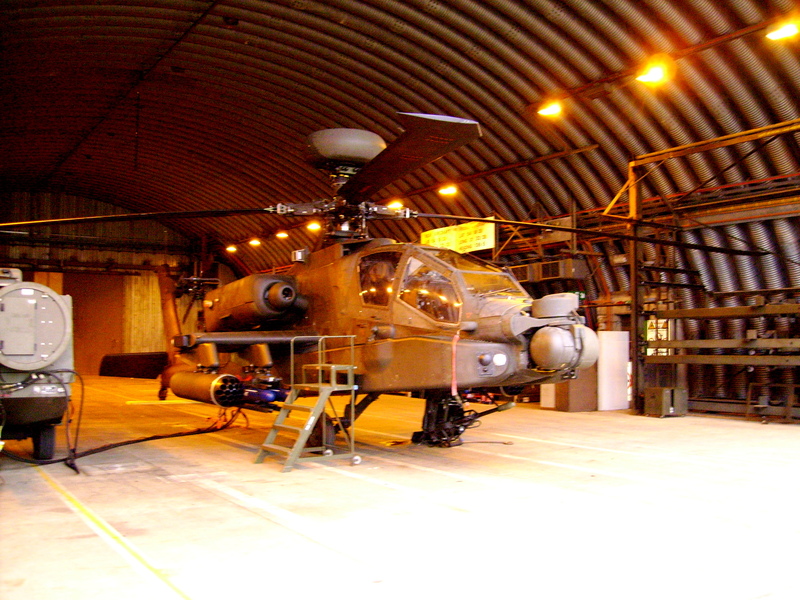 RAF Regiment personnel augment and support Royal Air Force operations by ensuring that airfields are well protected. 609 Sqn personnel are mindful of their proud heritage, which is commemorated by two memorials at Leeds Bradford Airport. 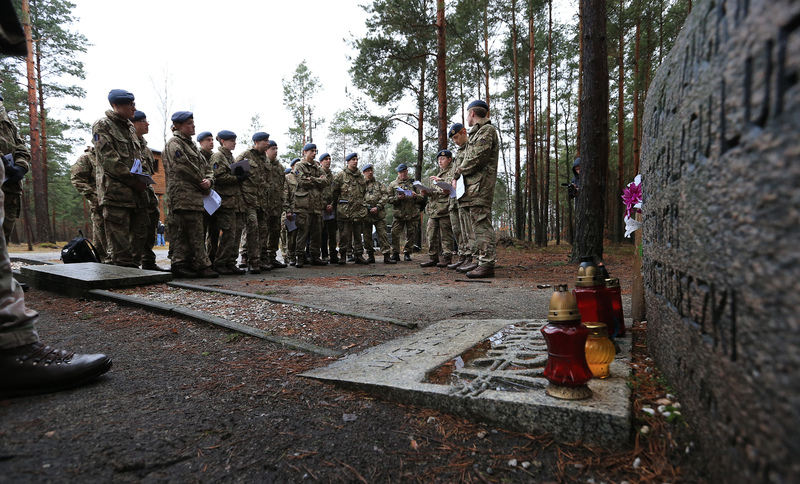 607 and 609 reservists take on "The Long March"
Reservists from RAF Leeming put on their walking boots to commemorate the 71st anniversary of the ‘Long March’ in Poland and Germany. 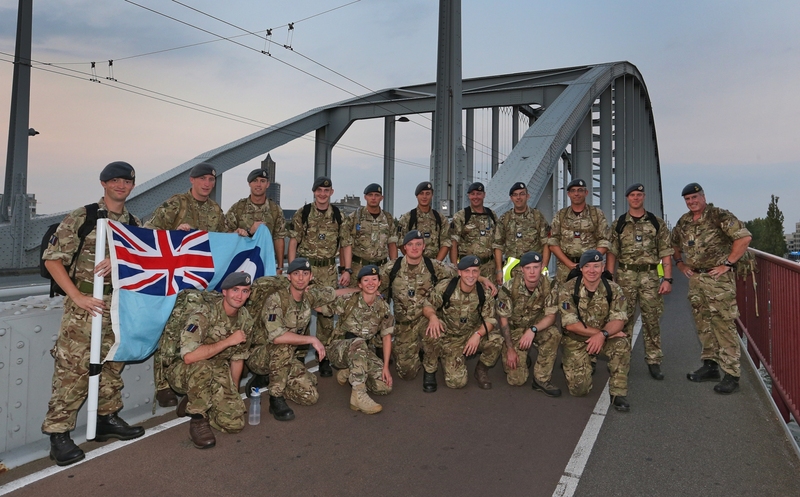 Personnel from 607 (County of Durham) and 609 (West Riding) Squadrons, Royal Auxiliary Air Force, walked the 60 mile historic route as part of Force Development - Exercise Long March. 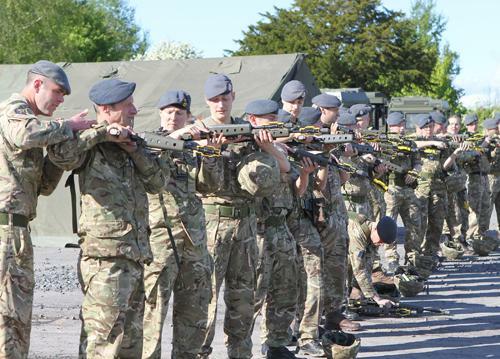 They joined a team which included personnel from Number 22 (Training) Group and servicemen awaiting trade training. The route retraced footsteps of the 10,000 allied prisoners who were forced to march across Northern Germany in 1945 during WWII beginning at the infamous prisoner of war camp, Stalag Luft III, Zágan, which is now part of Poland. This was the scene of The Great Escape, where 76 airmen escaped in 1944. The last man to set foot out of the escape tunnel was Skeets Ogilvie, who was a pilot with 609 Squadron. At least two other members of the ‘escape committee’ were pilots from 607 Squadron. The team stayed overnight in Hut 104, a replica of where The Great Escape tunnel entrance was located. 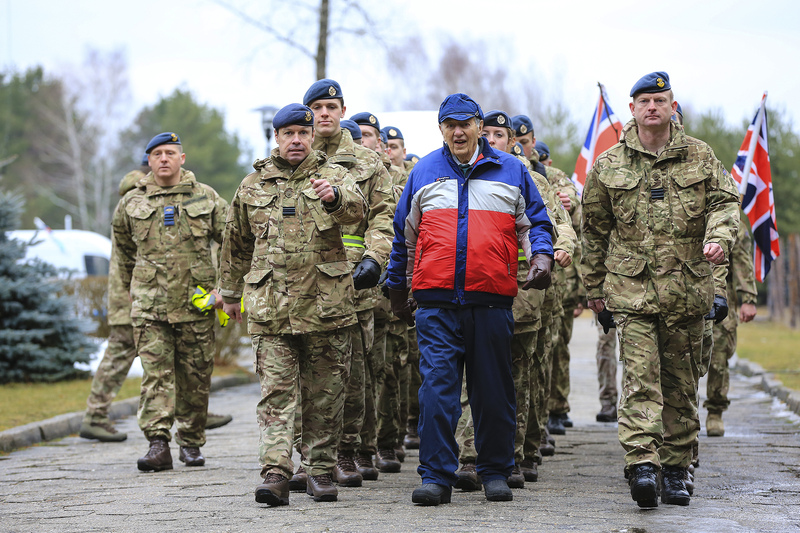 They were joined by president of the RAF POW Association and WWII veteran, Air Commodore Charles Clarke Ret’d, at the various points during the walk. Charles was shot down over Germany and imprisoned at Stalag Luft III in 1944 and actually endured the Long March in January 1945. Personnel were given the opportunity to speak with him about his WWII experiences. Photographer SAC Emma Walker said: “It was an absolute honour to take part in the Long March and to have one of the veterans with us was something that I cannot put into words and will never forget. To listen to his experiences first hand will stay with me. He told stories of the Germans saying “escaping is no longer a sport” after the numerous escape attempts but stated “the digging went on” with regards to the great escape – I could have listened to his stories for hours. I would say that the Long March has been one of the most interesting exercises I have been involved in”.Three days of walking included visits to various historical points of interest along the way and overnight stays in the Luszcyka Barns, Poland, and Bad Muskau, Germany. The walk finished at Spremberg, where during the war, the prisoners were sent across Germany via rail and road. Sqn Ldr Alfie Hall, 607 Sqn Executive Officer said: “We completed the 60 miles following the same route as the wartime PoWs in reasonable weather. When you consider that our predecessors covered that distance in chest-high snow, temperatures of -25 and colder in poor clothing and a poor diet it is incredible how any of them survived. To walk in their footsteps, especially with a Veteran who was actually there, was very humbling. The exercise finished with a formal dinner and discussions about past, present and future air power at Kliczkow Castle, Poland. As reported in the press this week, a Leeming Hawk pilot experienced loss of vision in an eye during a training sortie thought to be due to a sudden deterioration of an eye infection. At one point his vision was so poor that ejection was considered an option as landing safely was deemed unlikely. However a fellow pilot and instructor on the Hawk took to the air to formate with his aircraft and successfully guided him down to a safe landing. The cloudy and turbulent conditions experienced last thursday (28 Jan) made the recovery and landing more difficult and demonstrated the skills of formation flying regularly practiced by the Hawk pilots. 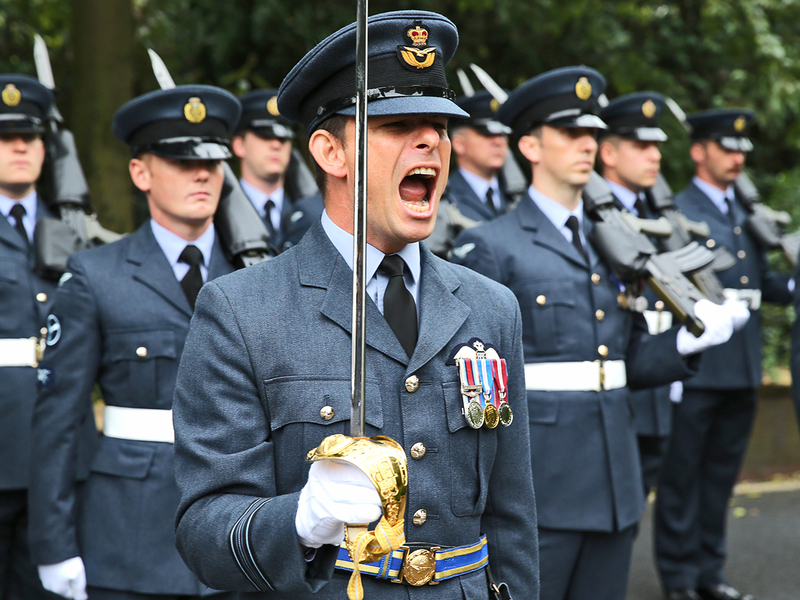 An historic RAF Squadron has welcomed its first recruits during a ceremony held at RAF Leeming. 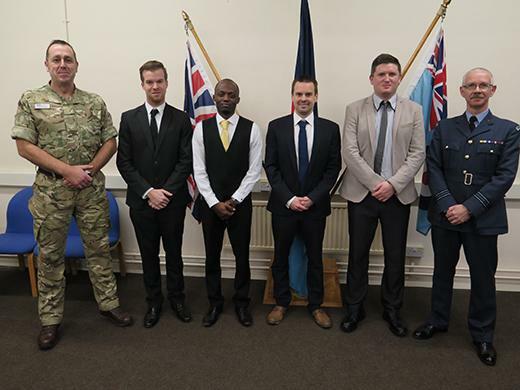 The General Support 607 (County of Durham) Squadron, which has been re-formed as a Reserves Squadron was delighted to formally accept four recruits into the RAF Reserves. The County of Durham Squadron has more than 120 vacancies for Drivers, Suppliers, Intelligence Analysts, Human Resources Specialists, Chefs and RAF Police, with no experience required, just an aptitude for the trade. Recruits are eligible to apply between ages 18 and 50 (56 with previous military service). Recruits are paid for their work and all uniforms, kit and equipment is provided. Recruiting is usually within a 50 mile radius . 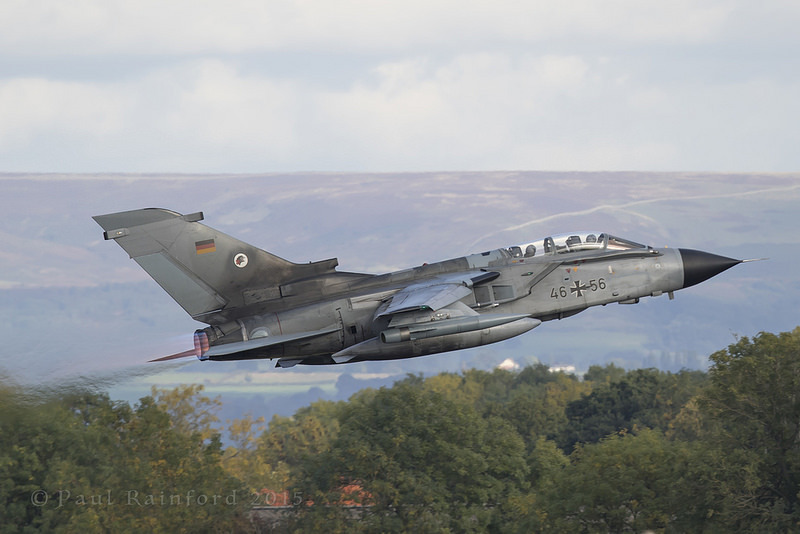 During October RAF Leeming hosted both German Tornados from TLG51 and UK Typhoons of 29 Sqn as shown in the two photos taken by member P. Rainford. More of Paul's photos can be accessed in the Members Zone. The photos below are by RAF Leeming. The RAF Leeming team took third place in RAF Photographic Section Portfolio category - which included a collection of their top six images taken throughout the year. 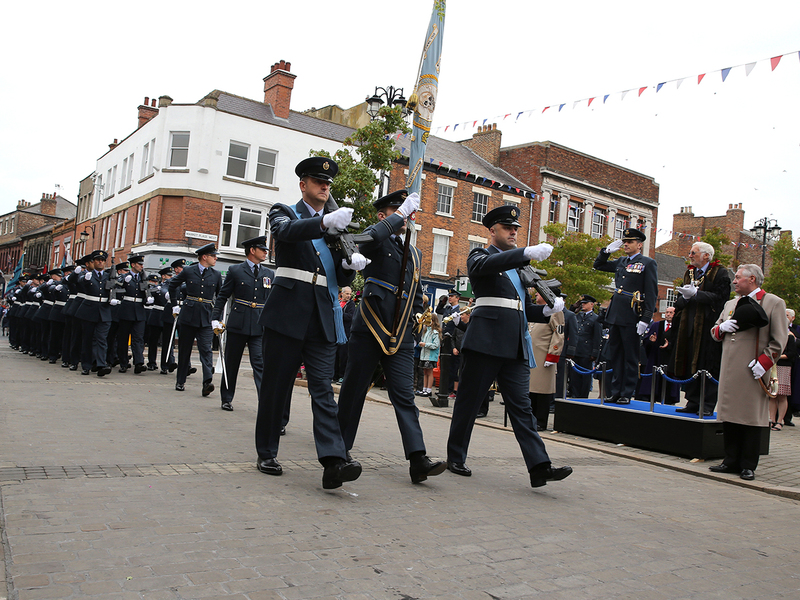 On Sunday 13th September, marching through the centre of Ripon to the rousing sound of the RAF College band were personnel from RAF Leeming marking the 75th anniversary of the Battle of Britain and celebrating being granted the Freedom of the City. 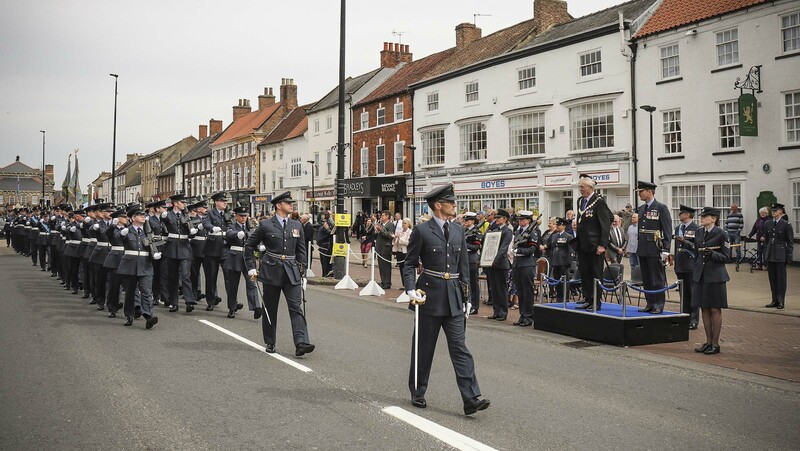 The Honorary Freedom of the City of Ripon was granted to Royal Air Force Leeming by Ripon City Council lead by The Right Worshipful The Mayor, Councillor Pauline McHardy. 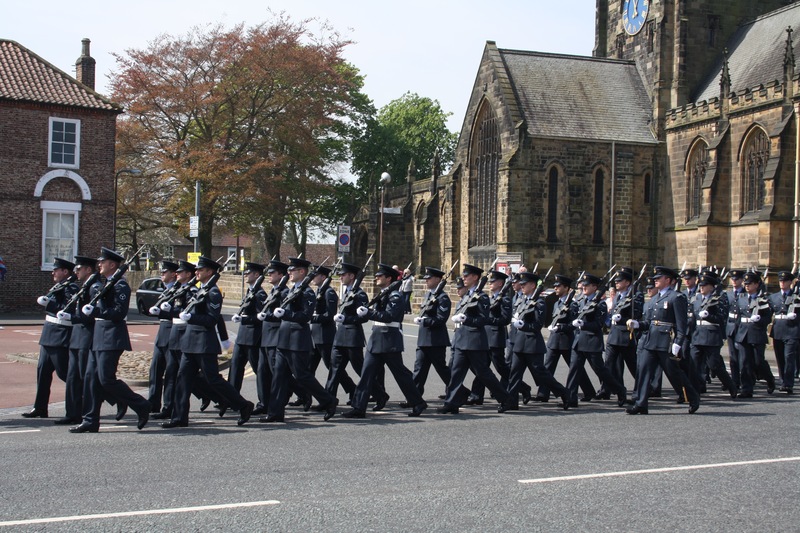 The City of Ripon and RAF Leeming have a strong relationship forged over many years, a number of service personnel from across the country have settled in the city as a result of being stationed in the area and several of them were proud to witness to the conferral ceremony. 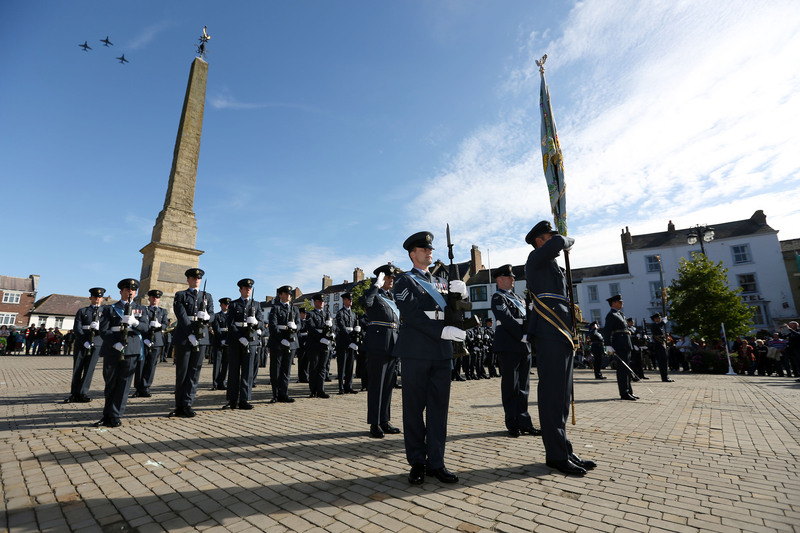 Residents clapped and cheered as the airmen and women from the North Yorkshire base paraded on to the market square and proudly displayed the Illuminated Address presented earlier in the week. 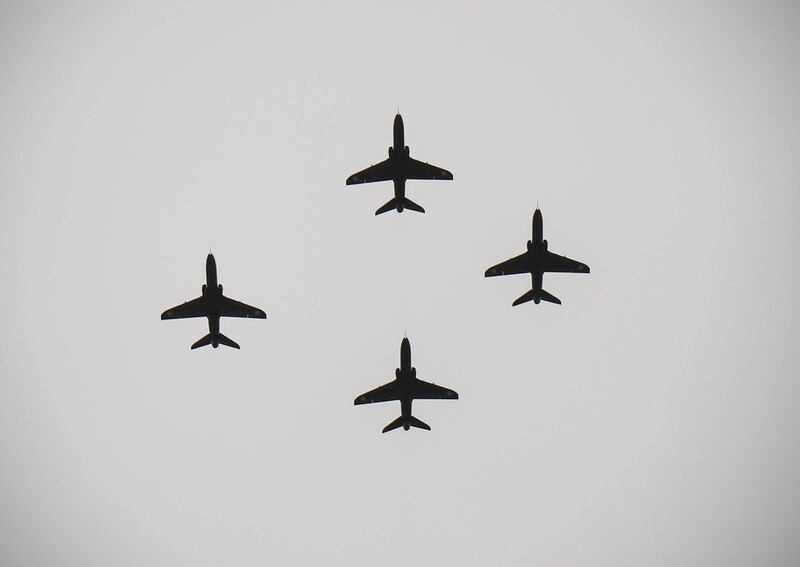 As the parade saluted the dais, there was a flypast of three Hawk jets from 100 Squadron. Both the Station Commander, Group Captain David Bradshaw and the Mayor stepped on the market square to inspect the parade. Councilor Mrs McHardy said: “It really was a pleasure to see them march through the city. 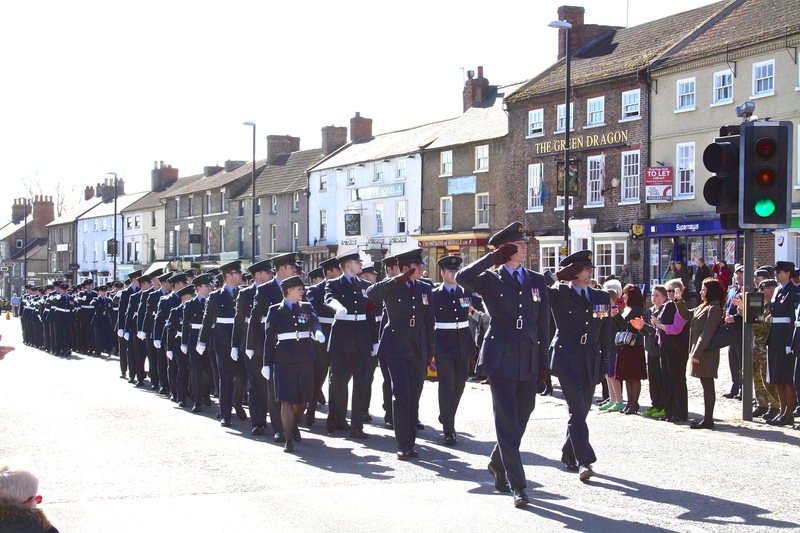 The Freedom of the City was conferred on Tuesday, so this was the first time personnel had been able to march through Ripon with their bayonets attached to their rifles. 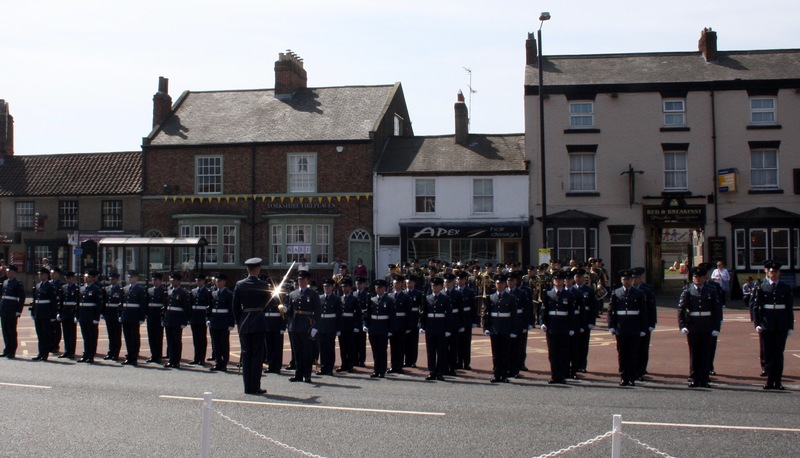 It was a pleasure to offer RAF Leeming the Freedom of Ripon, and an honour that they accepted it. 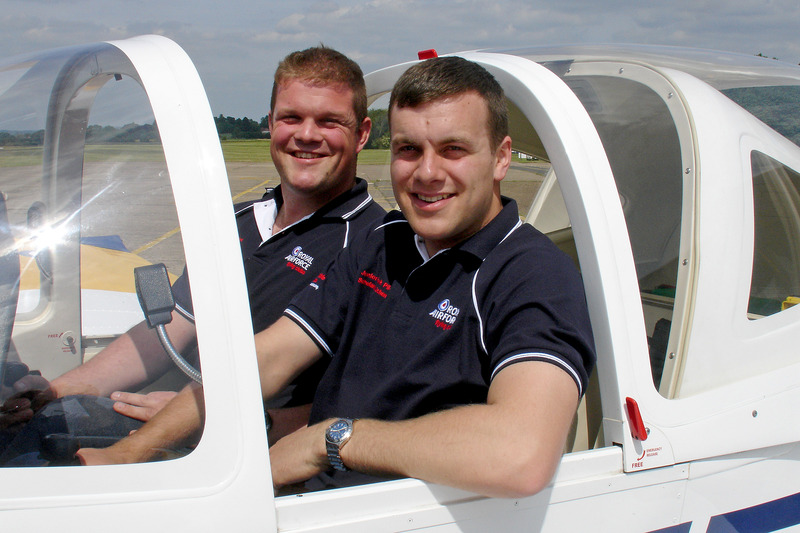 A Leeming Electrical Technician has taken to the skies on a solo flight as part of this year’s Junior Ranks’ Pilot Scholarship Scheme. The training, which can be logged towards the award of a full flying licence such as the National Private Pilot’s Licence (NPPL), provides 15 hours flying to reach solo standard. 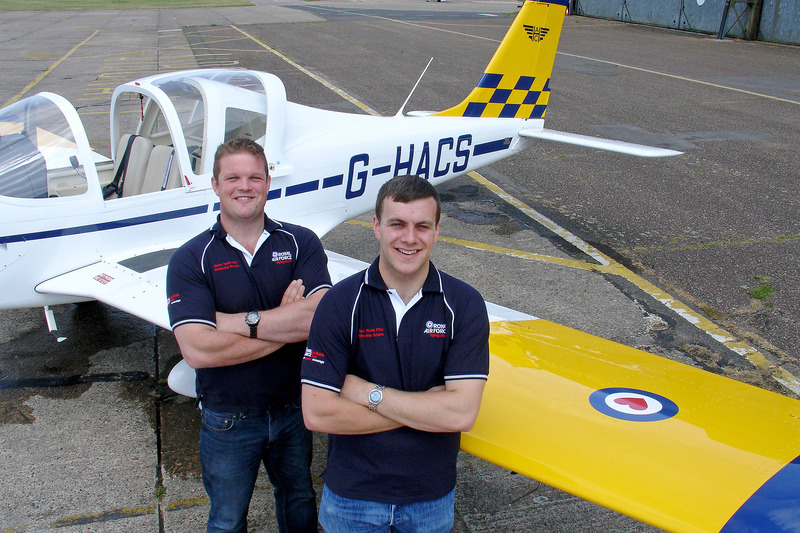 Cpl Gibbons achieved this in just ten hours of flying the Piper PA28, a four seater aircraft which he described as: “A bit Starsky and Hutch on the inside.” He was then able to gain further experience by completing a navigational exercise. 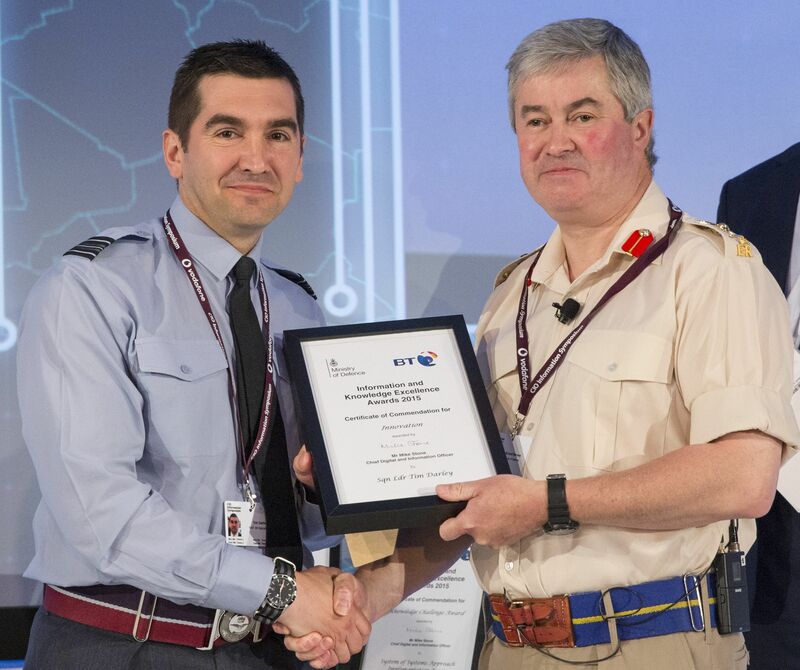 A member of 90 Signals Unit has received defence-wide recognition for revolutionising data management systems at the Air Warfare Centre. 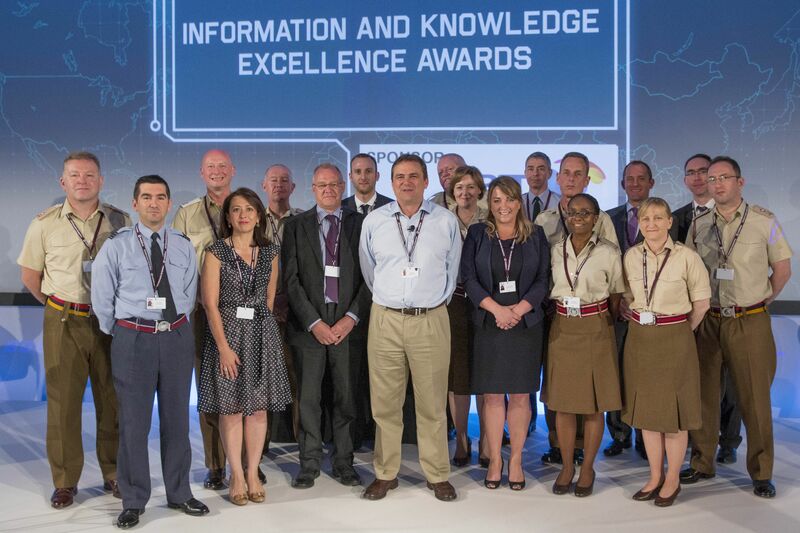 Sqn Ldr Tim Darley was presented with the award for Innovation at the 4th annual MOD Information Knowledge Excellence (IKE) Awards, which aim to recognise the efforts of Defence personnel who have managed and exploited information effectively, for the benefit of defence. During the prestigious event, awards were presented for a range of categories including Inspiring Leadership, Exemplary Practice, Innovation, Information Team of the Year and the Knowledge Challenge Award. The Innovation category is for those who have innovated or championed innovation leading to significant improvements in the exploitation of information and knowledge across their organisation. Sqn Ldr Darley was nominated after identifying that the Air Warfare Centre was heading towards 'cliff edge' with regards to accessing, storing and analysing vast amounts of air test and evaluation data. Introducing an innovative cloud based solution, Sqn Ldr Darley overcame significant technical and cultural issues to create an app-based tool. This allows analysts to 'visualise' data through g-cloud technology, reaching back to cloud-based data storage, and removing the constraints of operating platform, bandwidth and laptop. Sqn Ldr Darley is presented with his award by the Cdr of Joint Forces Command, General Sir Richard Barron and with all the award winners. 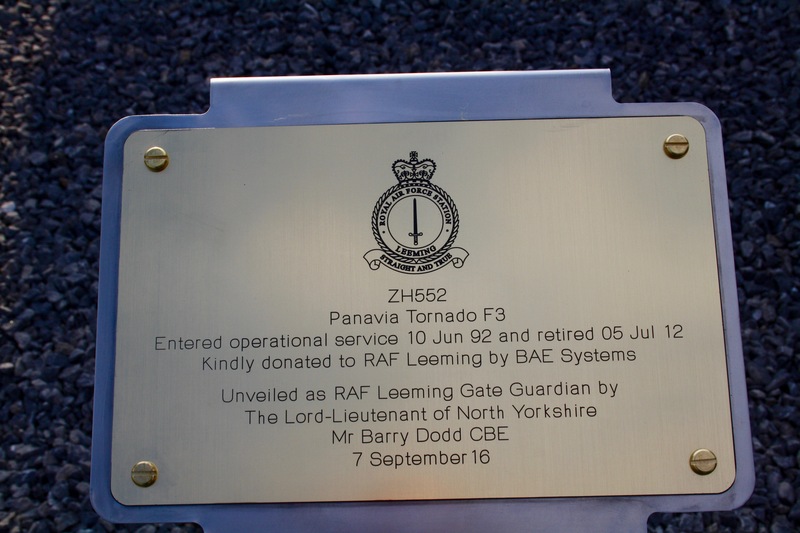 Leeming has maintained its link with the Tornado F3 when the last operational F3 airframe was received by the station. 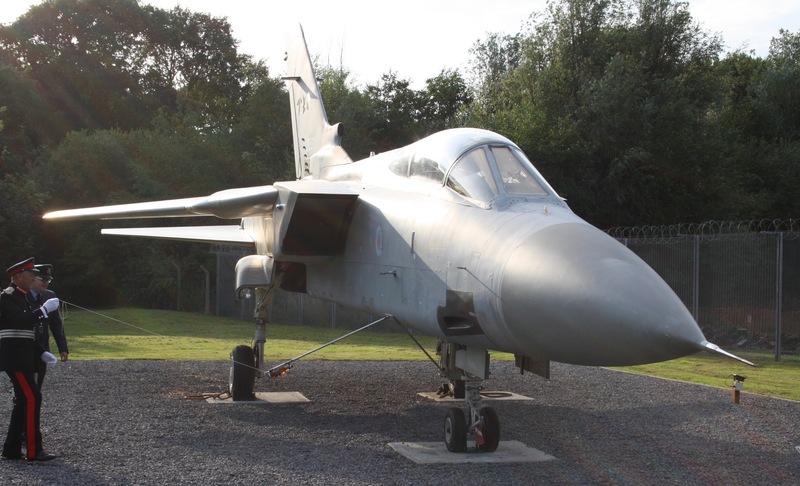 Following the removal of the Javelin earlier this year (see Members Zone), the F3 will take its place as Gate Guardian as a reminder of Leeming's F3 heritage. The Tornado F3 began its life at RAF Leeming back in 1988 with XI, 23 and XXV Squadrons forming the F3 Wing. The aircraft provided vital protection for the UK airspace and RAF Leeming squadrons regularly intercepted Russian aircraft up until April 2008. 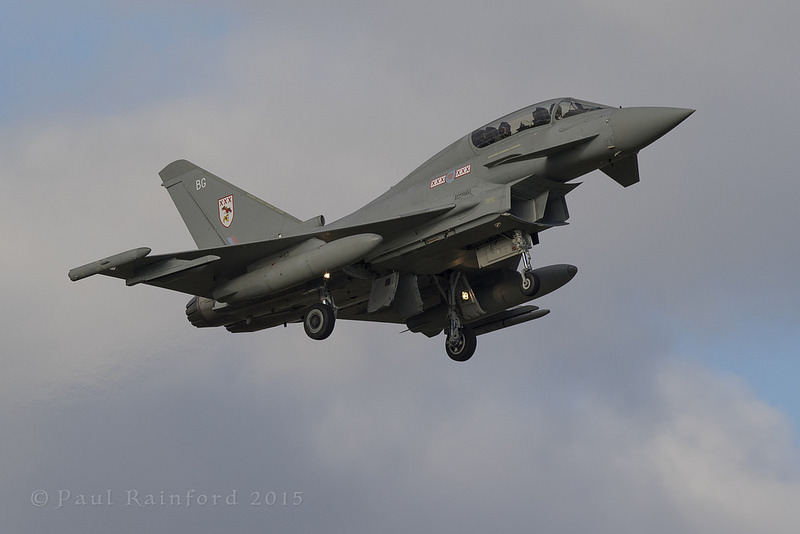 The F3's operational service ended in 2011 as it was replaced with the Typhoon. Since then, the remaining F3 aircraft have returned to Leeming to be run through a spares recovery programme, Reduce to Produce (RTP), run by BAE Systems. The final F3 was picked up from the RTP programme at the last minute and the airframe was rebuilt once stripped of its valuable assets. A feature on the provenance of ZH552 appears in our Members Zone. 34 Sqn, RAF Regiment has been awarded the prestigious Higginson Trophy, given out annually to the regular RAF Regiment Unit that has had the most achievements throughout the year. 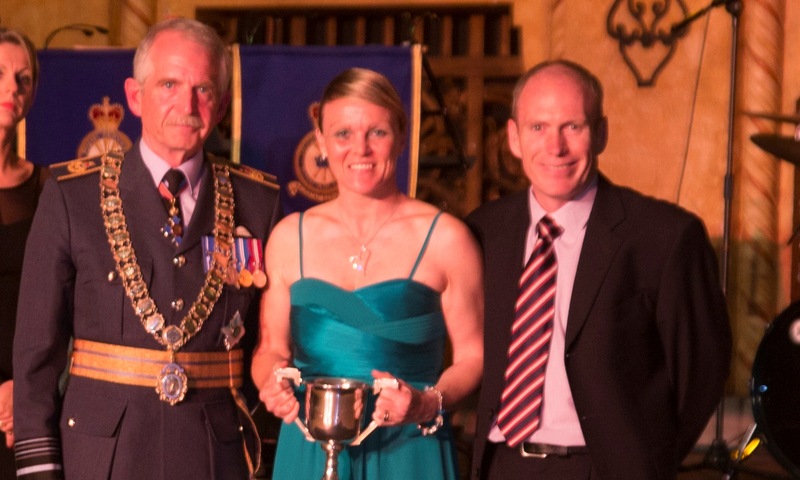 The Trophy was given in recognition of the Squadron’s provision of Force Protection to Camp Bastion and aircraft departing from and landing there as UK troops prepared to withdraw from Afghanistan at the end of 2014. It was a task that required months of planning and training. Squadron Leader Sam Wiseman, Officer Commanding 34 Sqn, said: “We maintained the perimeter defensive positions as well as conducting patrols. The accolade of the Higginson Trophy was, according to Sqn Ldr Wiseman, well earned by every member of the squadron. “I couldn’t be more proud because of the context of the tour. It’s great to get recognition from the Corps that we performed really well throughout the year. There was political, media and military pressure at the end of UK involvement in such a major operation. We had zero attacks against Camp Bastion or any aircraft while we were there, and we brought everybody back. missions during a major NATO exercise. Flying from Amari Airbase, and working alongside U.S.
and simulating lots of different threats. Photo - A 100 Sqn pilot returns after a sortie from Amari. Photo by LAC Cathy Sharples. 90 Signals Unit marks the end of 13 years service in Afghanistan with a parade through Bedale. 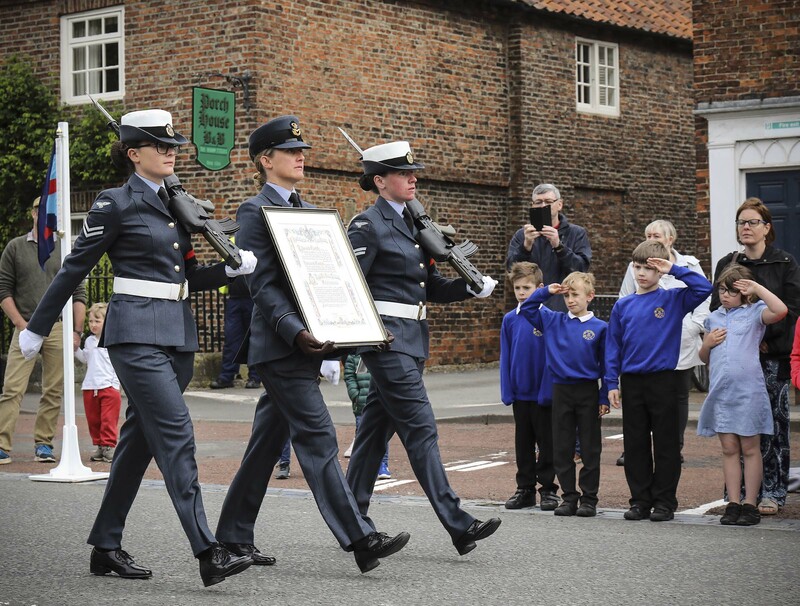 Personnel from both the Tactical Communications and Force Generation Wings of 90 Signals Unit paraded along Bedale High Street to mark the end of Operation Herrick for the RAF's longest continuously serving unit in Afghanistan. 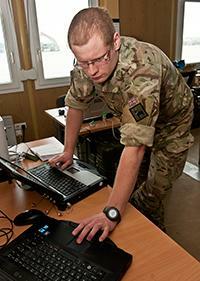 90 SU delivered secure communications systems and Air Traffic Control capabilities in support of Uk Forces deployed to Helmand, Camp Bastion, Kandahar Air Base and in Kabul. 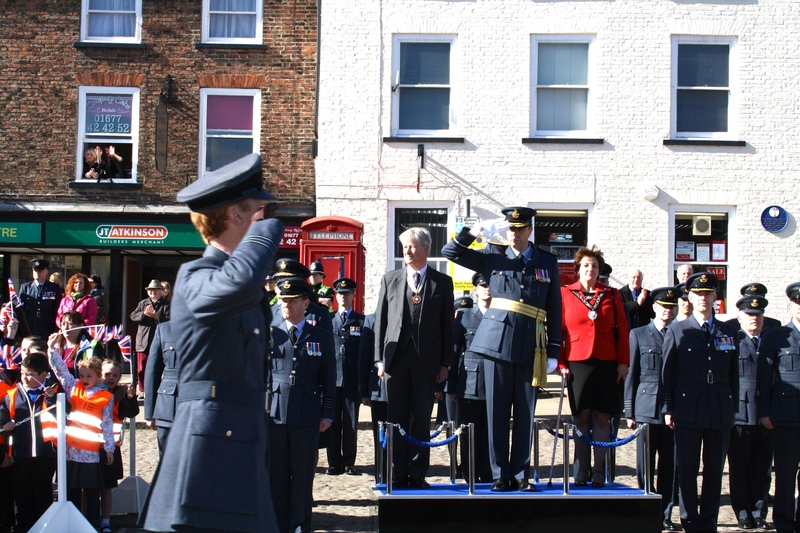 Taking the salute from the parade was the 38 Group AOC, Air Vice-Marshal Tim Bishop, accompanied on the dias by the Mayor of Bedale, Cllr Christine Mallard. 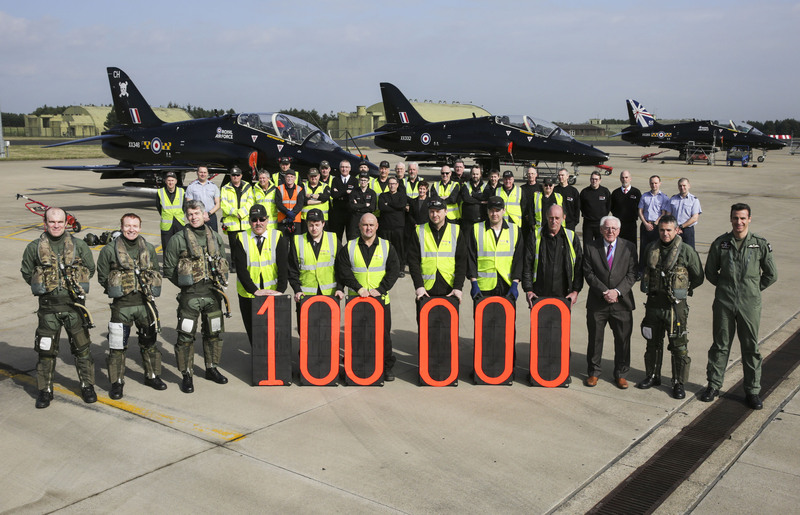 Personnel from 100 Squadron and their engineering support contractor Babcock Defence & Security Division celebrated 100,000 hours of Hawk flying. 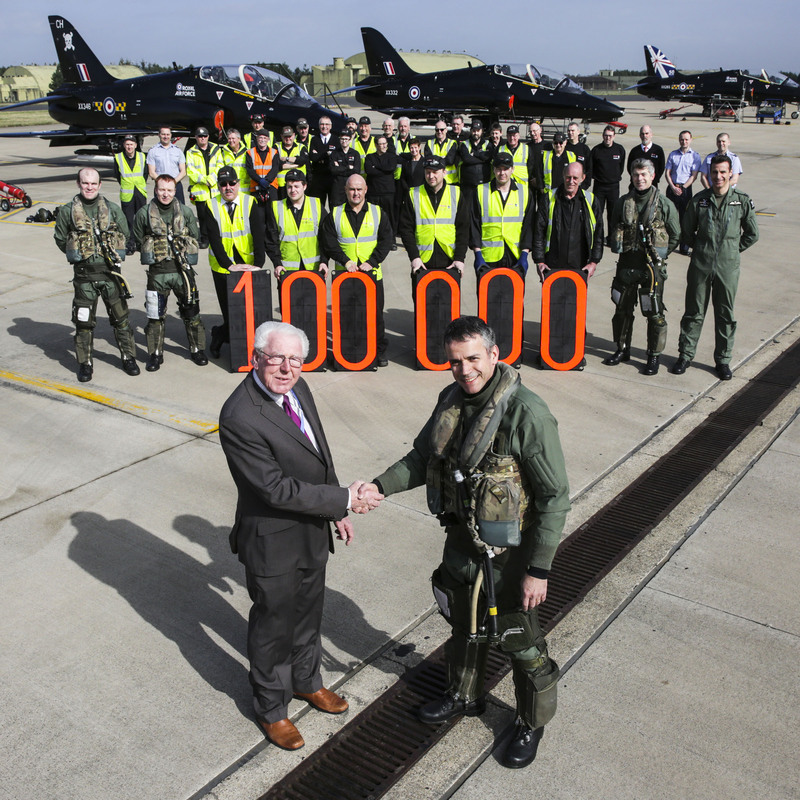 The milestone was marked with a routine low level training flight crewed by Officer Commanding 100 Squadron, Wing Commander Tony Cann and the RAF Leeming Station Commander, Group Captain David Bradshaw. 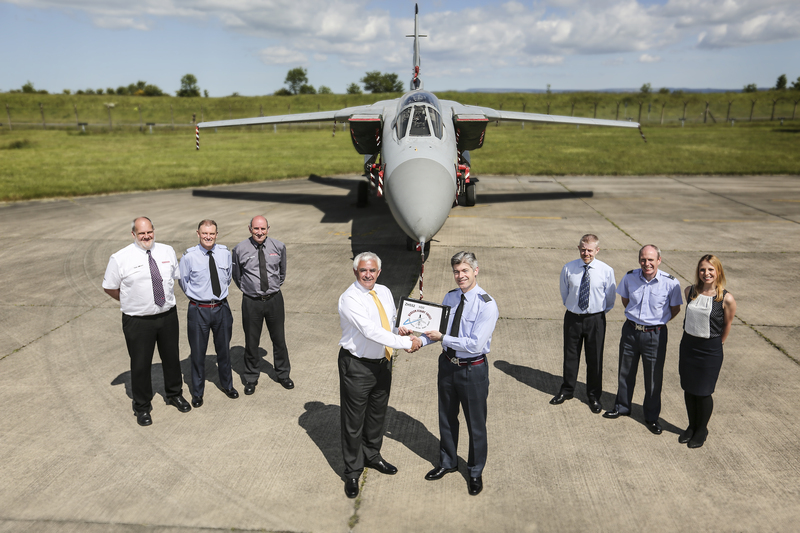 Mr Terry Tucker, Principal Engineering Manager, Babcock with Wg Cdr Tony Cann, OC 100 Squadron and the 100 Sqn team. 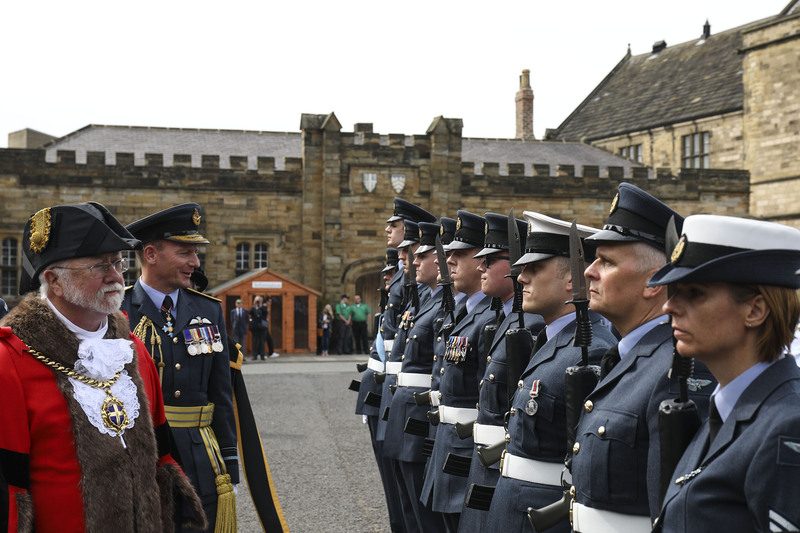 Personnel from RAF Leeming’s newest squadron have been marking its reforming by commemorating its prestigious past. Personnel from 607 County of Durham General Service Support Squadron laid a wreath at the North East Land, Sea and Air Museum (NELSAM) to commemorate its 85th Anniversary. Formed as a day bomber unit of the Auxiliary Air Force on 17 March 1930, 607 Sqn operated from France during the early years of World War II, performing a fighter role in the Battles of Britain and France. Curator and founder of NELSAM, John Stelling and his colleague Brian Dixon joined members of 607 Squadron for the short ceremony and wreath-laying at the memorial on the former site of RAF Ouston. Personnel were then given a tour of the museum, which includes a room dedicated to 607 Sqn. Wing Commander Dobson added: “As 607 Sqn Royal Auxiliary Air Force [RAuxAF] starts a new chapter in its history, today was a poignant reminder of the sacrifice and courage shown by its former members and how we, as the new custodians of the Sqn, must ensure that we maintain that legacy and treat it with the respect it deserves. The museum tour was followed by a trip to ‘The Durham Brewery’ to collect a specially-designed and labelled batch of one of its best-selling beers. 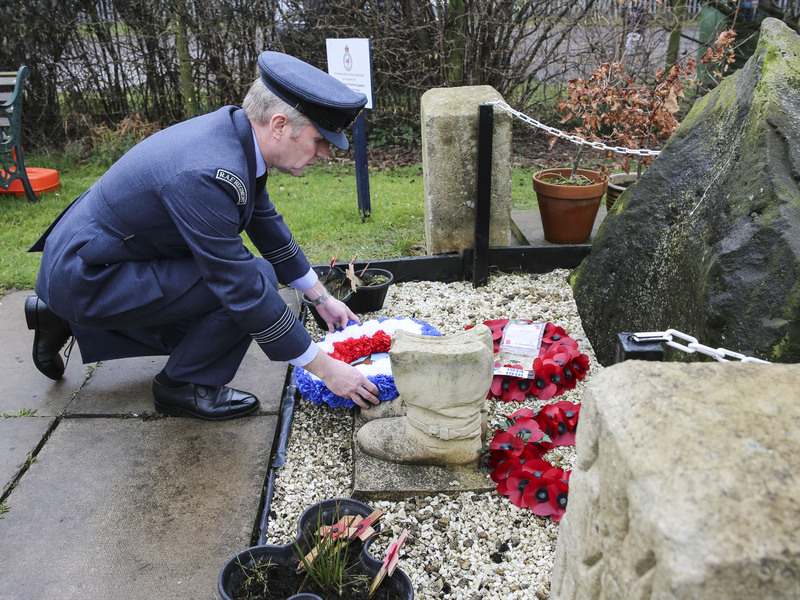 Photos - OC 607 sqn Wg Cdr Andrew Dobson lays a wreath at the Museum. 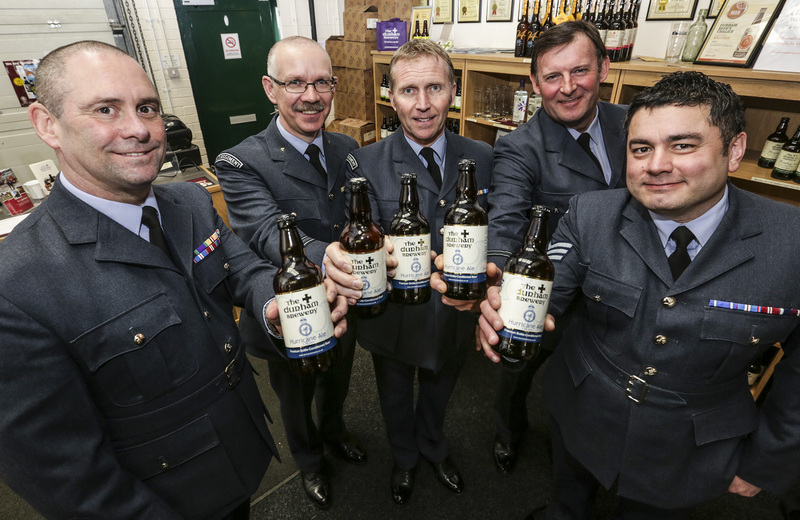 At the Durham Brewery are l-r RAF Leeming Stn W.O. Steve Ward with 607 members, Sqn Ldr Alfie Hall, Wg Cdr Andrew Dobson, Flt Lt Peter McKeen and Sgt Paul Ovington. 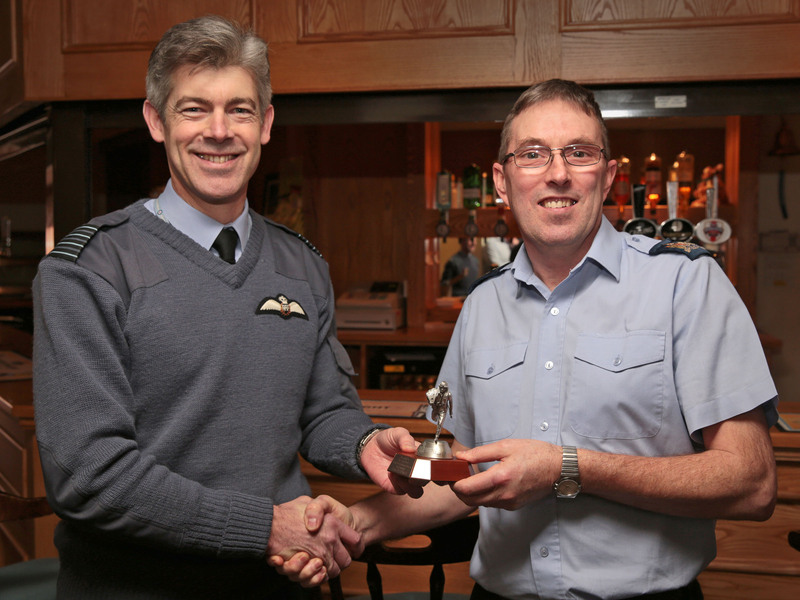 Warrant Officer Colin Finch retires after 37 years service in the Royal Air Force. 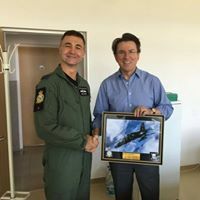 A Warrant Officer based at RAF Leeming has retired after more than 37 years of service in engineering and aircraft maintenance. Warrant Officer Colin Finch (54) joined the Royal Air Force in 1977 and trained as an Aircraft Fitter (Airframe). His outstanding technical skills saw him swiftly promoted through the ranks. His final role was with the Continuous Airworthiness Management Organisation, Engineering Logistics Wing, working closely with the black Hawk aircraft of Number 100 Squadron. Although he does not formally retire from the Royal Air Force until the end of May, he has already started his transitional training for a future role within Babcock, which provides vital engineering and service support to military flying. Colin’s new role will see him remain at Leeming where his wealth of experience in aircraft maintenance will continue to be utilised. Photo- W.O. 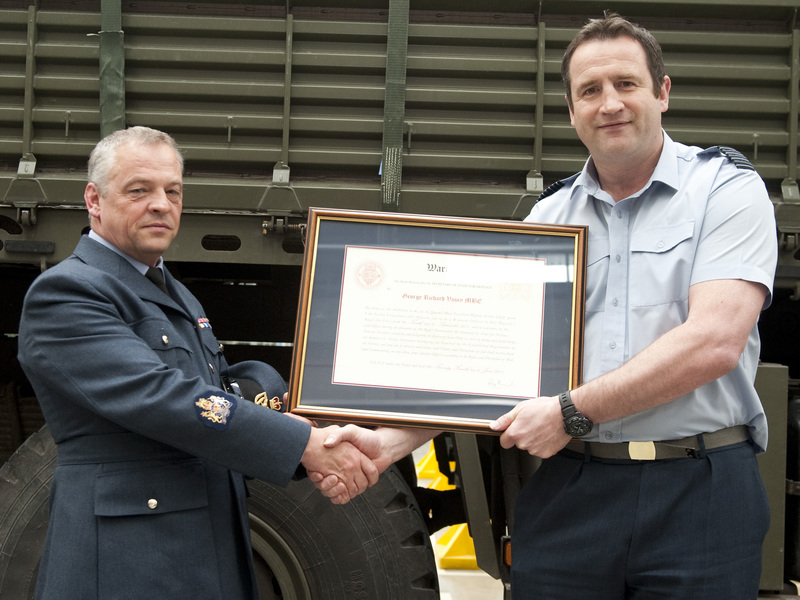 Colin Finch is presented with "The Escaping Airman" by Gp Cpn Bradshaw. 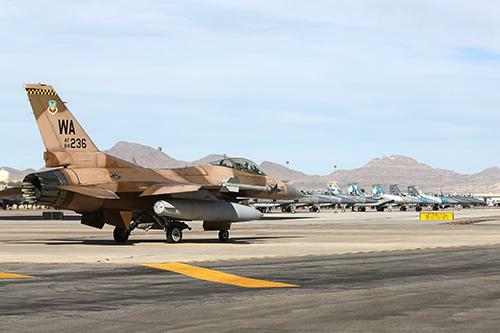 A 64th Sqn F-16 on the ramp at Nellis. For more info about Red Flag see the RSS news feed in the RAF zone page of website. Hawk pilot Squadron Leader James Porteous is part of the RAF party. He said: “In the aggressor role we play the adversary. We simulate enemy tactics and capabilities although differ from other aggressor squadrons by also providing close air support training for land forces and training for the Joint Force Air Component. Known as Red Air, the aggressors on Red Flag increase their potency as the exercise progresses, pushing coalition fighter pilots to the extreme. 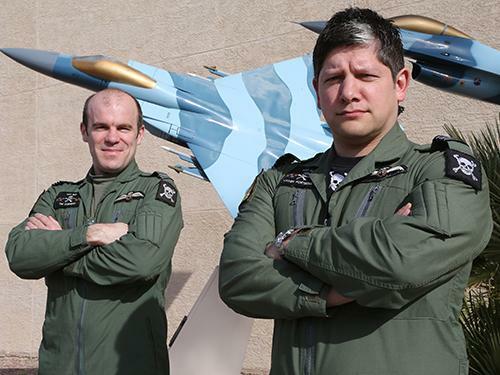 Sqn Ldr Porteous: “The 64th Aggressor Squadron is the world leader in providing a credible and effective red air aggressor and have been doing so for years. Although our aircraft are unable to replicate some of the high-end fourth generation threats the Americans run, their knowledge of potential adversaries and the way they adhere to aggressor tactics is something we’re seeking to copy in the UK. “It’s been a really worthwhile visit. We’ve learnt the USAF has a holistic approach to red air, it’s not just the aircraft and the crews, it’s their ethos, the way they fly and the fact they have dedicated ground controllers and intelligence officers constantly looking at emerging threats. Photos - Spike with a NUAS Grob Tutor and some current students on the Sqn. An RAF Leeming photographer has captured history on the 70th Anniversary of Operation Market Garden, one of the largest airborne assaults carried out during the Second World War where the Allies looked to capture key bridges in German occupied areas of Europe and force entry into Northern Germany. 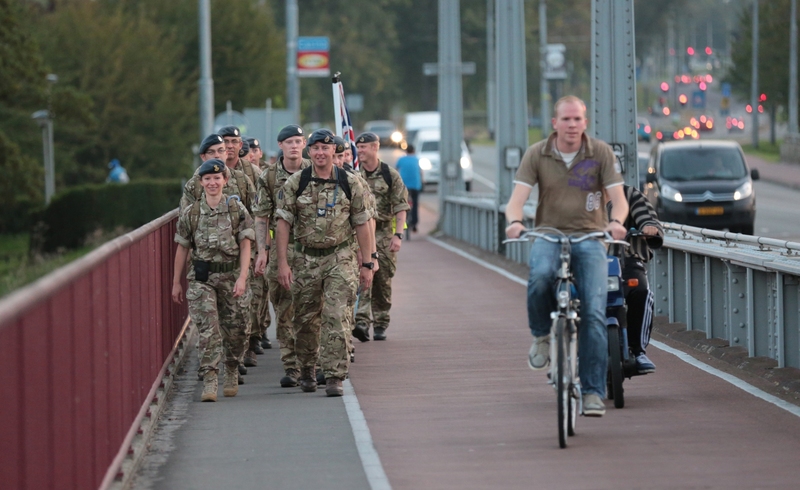 Sergeant Peter George, who recently won second place in this year’s Royal Air Force Image of the Year competition was part of a team of RAF personnel who marched more than 70 miles along the historic ‘Highway 69’ which was later nicknamed ‘Hells Highway’. This followed the route used during the Allies’ armoured advance – which started in Belgium and crossed all the captured bridges up to their main target of Arnhem, where troops, weapons and equipment were already being deployed by air. Following the march, Sgt George was able to capture the moments when Medical Support Officer, Flight Lieutenant Susie Phillips retraced the footsteps of her grandfather, Sergeant Albert Joseph Shortland, who was injured during conflict in Oosterbeek. He was taken to a nearby aid station – the Vicarage (the home of Kate ter Horst) with shrapnel wounds and was later captured as a Prisoner of War. It was a visit to this location ten years ago which inspired Flt Lt Phillips to join the Royal Air Force. 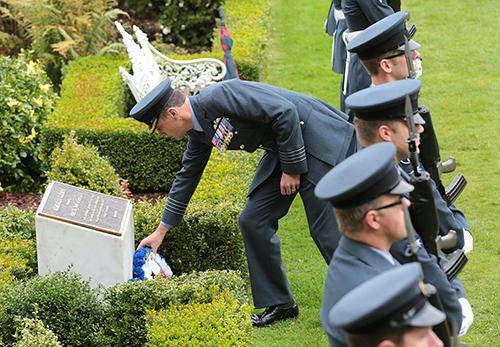 She was invited to lay a wreath on behalf of the RAF at the Arnhem Memorial. During commemorations in Arnhem, Sgt George was also able to meet some of the surviving veterans who were involved in the operation, and hear their stories first hand. Private Stephen Morgan, Second Parachute Battalion, was one of the many men who dropped into conflict in Arnhem. 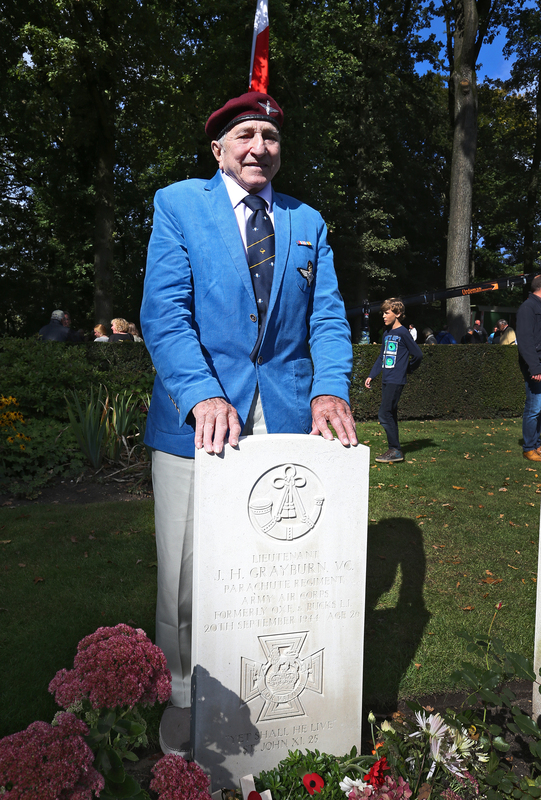 He had returned to the Arnhem Oosterbeek War Cemetery to remember those who were lost. Mr Morgan visited the headstone of Lieutenant J. H. Grayburn. VC. Parachute Regiment, Army Air Corps – a man he fought alongside whilst surrounded by Germans firing rifles. Under heavy fire, only two of them remained under the bridge they were occupying. Unfortunately Lt Grayburn was killed as they both ran for cover. 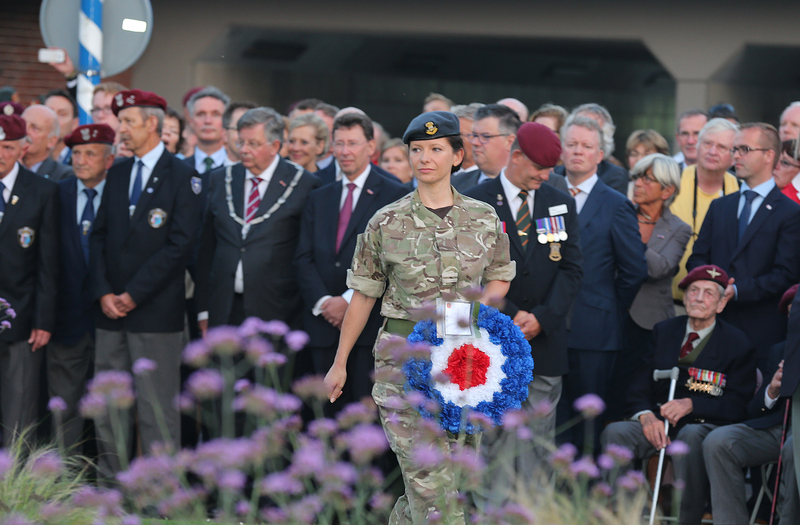 Flt Lt Susie Philips lays a wreath at the Arnhem Memorial. The Team marches across one of the bridges along "Hells Highway". Finally the finish after three days hard marching. Private Stephen Morgan at the headstone of Lt J. H. Grayburn, VC at Arnhem Oosterbeek War Cemetary. Falcon, is a cutting edge secure broadband voice and data communications system, and was used by 1 (Field Communications) Squadron, 90 Signals Unit in support of “Operation AZOTIZE” in Lithuania. 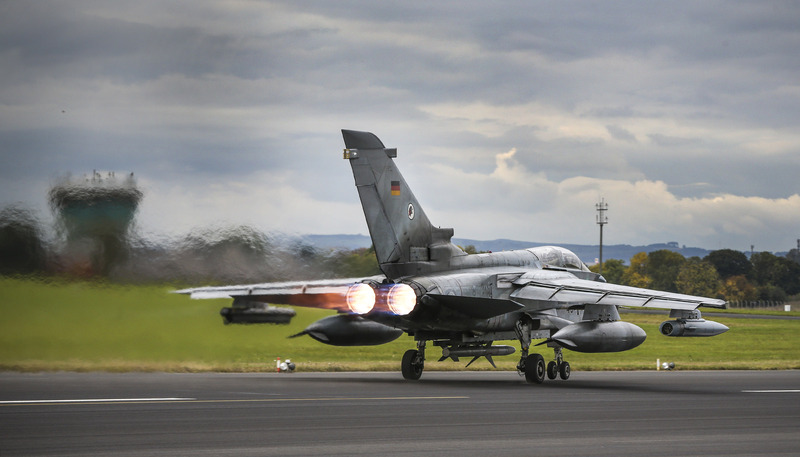 The operation, which ended in September, included four British Typhoon aircraft from 3 (Fighter) Squadron, which were sent to the country to help police Baltic airspace with Falcon providing essential communication networks to the crew. The system, which came into service in last year, provides tactical data links, managing large amounts of critical information provided by Intelligence, Surveillance, Target Acquisition and Reconnaissance (ISTAR) assets. This information is shared on a secure network through radios, telephones and video links. Op AZOTIZE has now concluded its operations and the Army is now in the process of deploying Falcon to support British teams deployed to Sierra Leone to help tackle the Ebola virus. 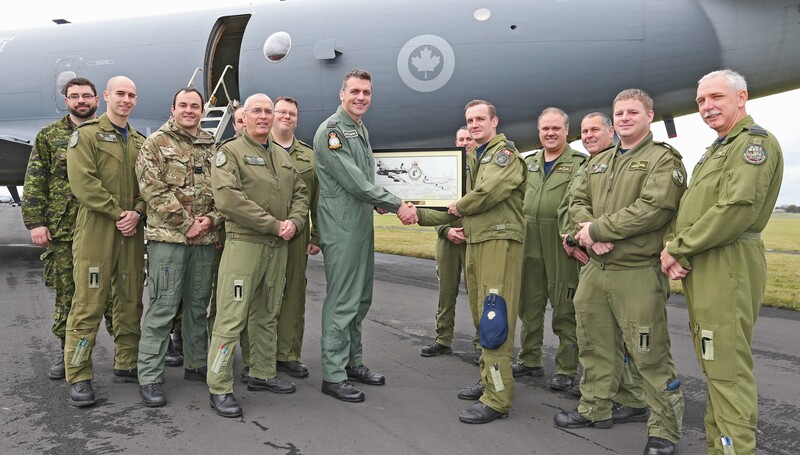 A Royal Canadian Air Force (RCAF) Squadron based at RAF Leeming during World War II returned for the first time since 1943 to take part in Exercise Joint Warrior. Joint Warrior is a multinational exercise, hosted in the UK and incorporates all three of the Armed Forces – the Royal Navy, Army and Royal Air Force and numerous visiting units from allied nations. Ships, submarines, aircraft and ground troops from the UK, US and other allies took part, battling each other at sea, in the air and on land in an area which stretches from the Irish Sea, north to Cape Wrath and east to the Moray Firth. 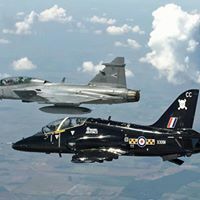 A crew from 405 Sqn (RCAF) has been based at the North Yorkshire airbase for the duration of the exercise and is its first return to RAF Leeming since 1943 when it flew Halifaxes as part of No.6 Group, Bomber Command. Now flying the CP-140 Aurora, the squadron has provided maritime air support to the exercise, coincidentally flying at night as they did during WWII. RAF Leeming was also host to aircraft and crew from the US and France taking part in the exercise. Joint Warrior as a whole involves more than 3000 personnel from across 16 nations, simulating scenarios of a number of current and potential future operations. 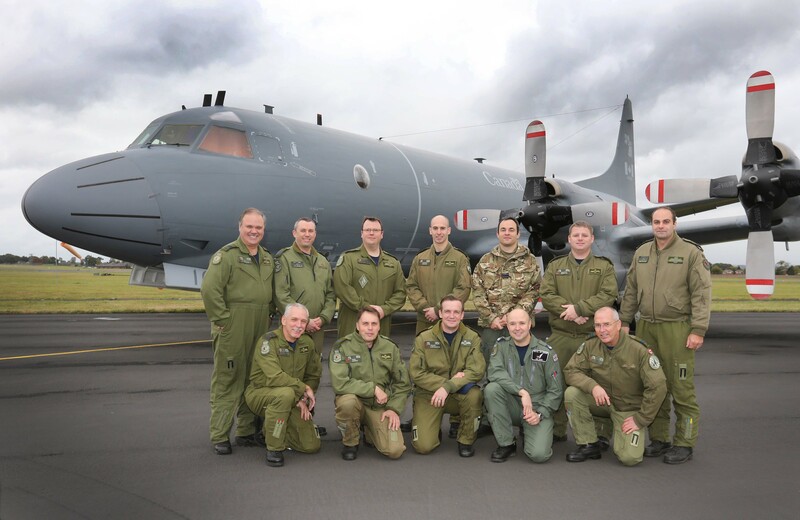 405 Maritime Patrol Sqn, Royal Canadian Air Force at RAF Leeming for the first time since 1943 with their aircraft , CP-140 Aurora. Master Corporal Mark ‘Edge’ Ejdrygiewicz presents RAF Leeming Station Commander, Group Captain Steve Reeves with framed artwork. 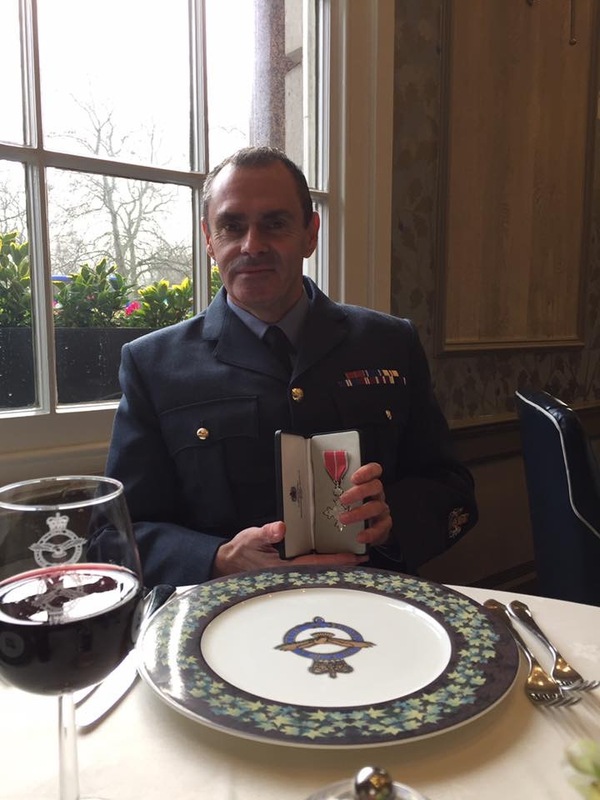 A Senior NCO at Leeming, Flt Sgt Burke was presented with a prestigious award for his professionalism, his drive to deliver excellence and his outstanding dedication to the local community. Flight Sergeant Robert Burke, part of the Navigational Aids Flight at 90 Signals Unit, was presented with the Wing Commander Bye Sword. 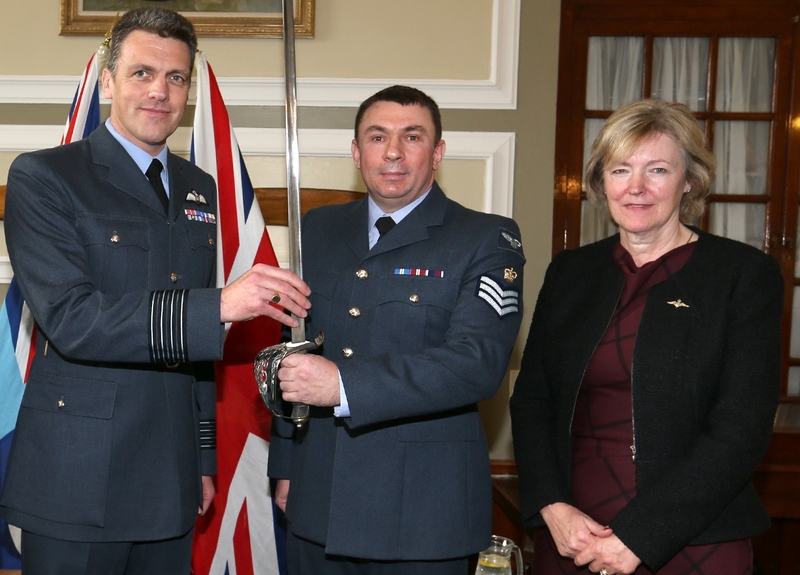 The Sword is given in memory of Wing Commander David Bye, who lost his battle against cancer in 2005 at the age of 47. 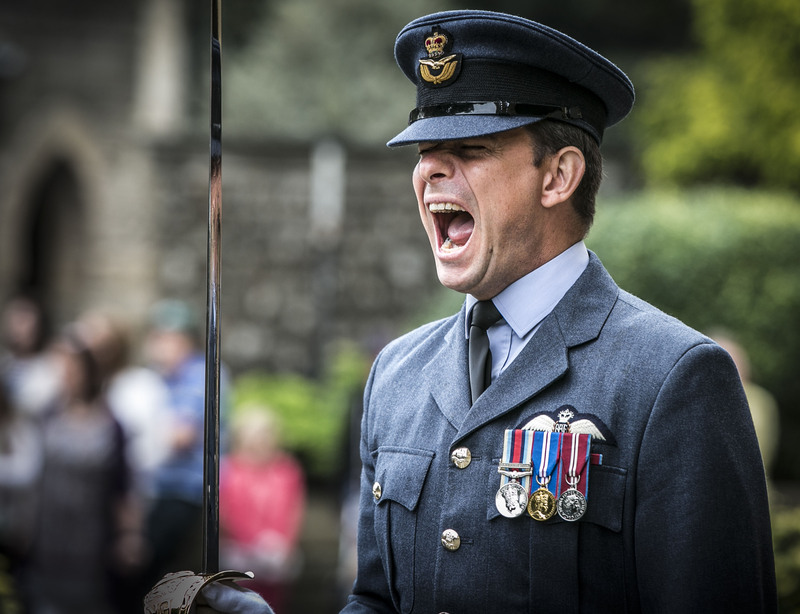 The Sword is presented annually to the Junior Officer or Senior Non-Commissioned Officer at RAF Leeming who has made the most significant contribution to life on station and/or the local community. Flight Sergeant Burke was put forward by his line manager Flight Lieutenant Hannah Jenkins for planning and implementing a large scale change within the Navigational Aids Flight and also leading a major re-structuring project. He enthusiastically embraced all of these tasks, ensuring at all times the provision of maintenance for navigational aids whilst supporting the operational output of airfields and ranges. Flight Sergeant Burke is described as an excellent technician, a first class leader and manager. He is respected by his colleagues and considered an inspiration to those around him. Quality is always at the heart of his approach; he has an exceptional commitment to the work place and can regularly be found working long hours. RAF Leeming personnel joined members of Romanby and Wetherby Golf Clubs to pay tribute to a downed WWII Halifax Bomber crew. 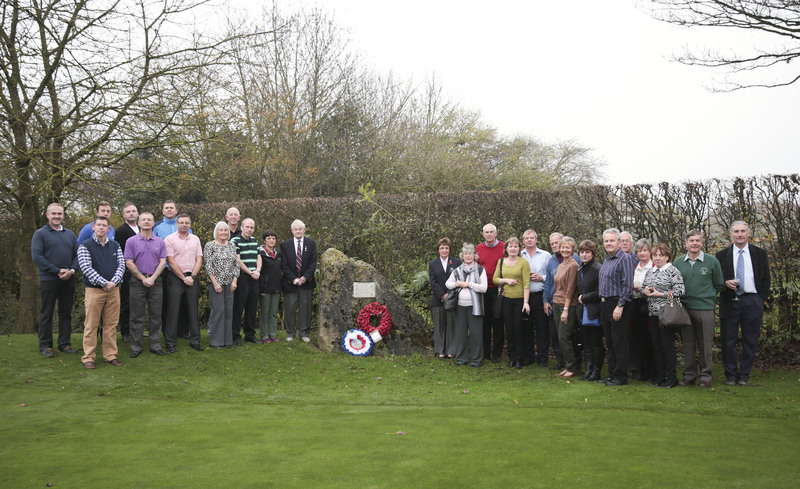 The event was held at Romanby Golf Course in commemoration of a 427 (Lion) Squadron, Royal Canadian Air Force (RCAF) Halifax Bomber which crashed on 21 February 1944 shortly after take off from RAF Leeming, killing all seven crew members on board. The lake on the 5th Fairway of Romanby Golf Course marks this site. The match was also attended by WWII veteran Mr Doug Petty who was based at RAF Leeming as part of Bomber Command, RCAF 429 (Bison) Squadron. 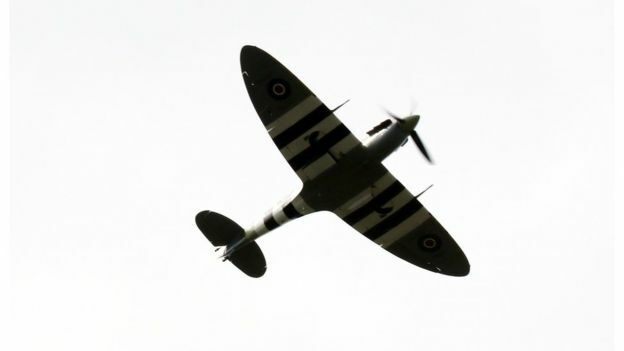 The annual competition between Romanby and Wetherby Golf Clubs is held to mark their joint history as former WWII crash sites of RAF aircraft. 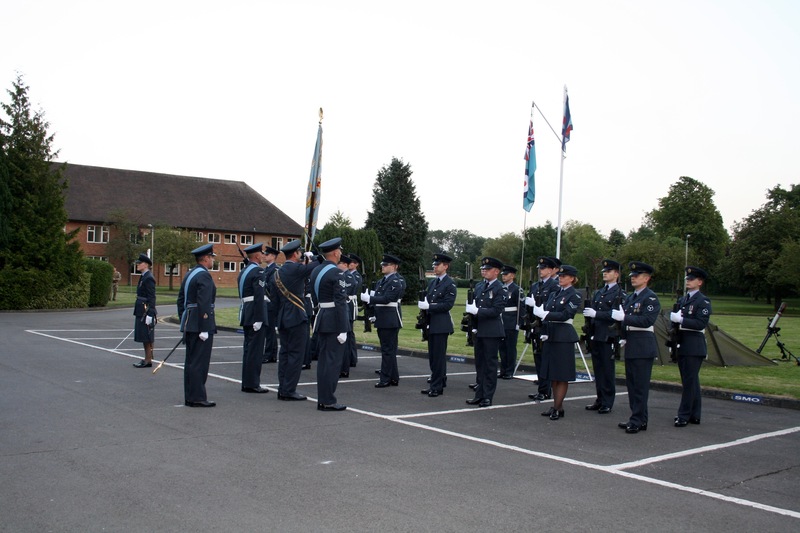 At an official ceremony on 5th December Group Captain David Bradshaw took command of RAF Leeming. Group Captain David Bradshaw joined the Royal Air Force as a University Cadet at Bristol University in 1988 and was selected to fly the Harrier GR7 achieving combat ready status in 1996. A busy tour on 3(F) Squadron, RAF Laarbruch, included operational flying over Bosnia and Kosovo and a lengthy deployment onboard HMS Illustrious in support of Operation BOLTON over southern Iraq. In 2000, he successfully completed the Qualified Weapons Instructor (QWI) Course and was posted to 20(R) Squadron, RAF Wittering, as a staff QWI. During this instructional tour, David was selected to be the RAF 2001 Harrier Display pilot. Promotion to squadron leader in 2002 saw his return to the Joint Force Harrier front line as a flight commander on IV(AC) Squadron at RAF Cottesmore. David was OC Attack for the combined IV(AC) and 1(F) Squadron deployment to Ahmed Al Jaber, Kuwait, for the warfighting phase of Operation TELIC. Having completed this tour in 2004, he hung up his flying suit and became the career manager for some 350 junior officer fast jet pilots. 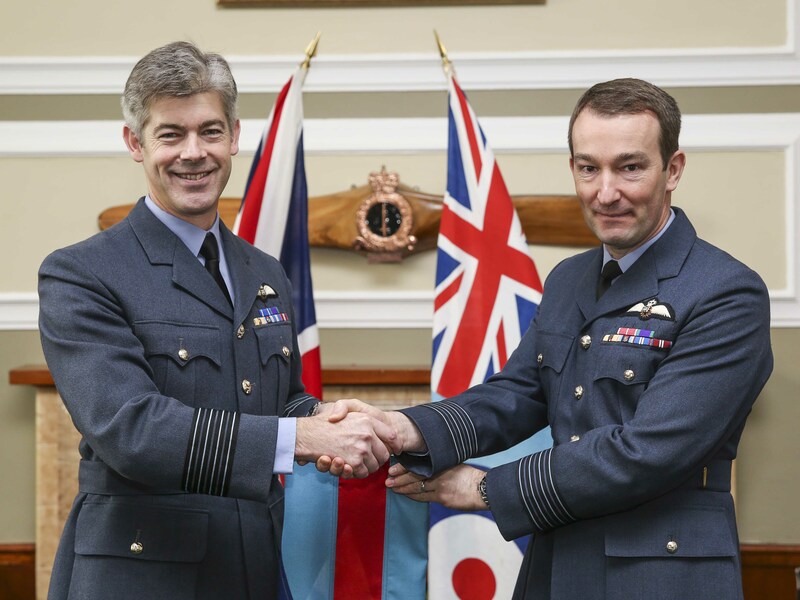 Two years within the RAF Personnel Management Agency at RAF Innsworth culminated in promotion to wing commander and selection for the Advanced Command and Staff Course at Shrivenham. He graduated with an MA in Defence Studies in mid-2007 and assumed the role of Assistant Director (Integration) within the Directorate of Equipment Capability, Deep Target Attack with specific responsibility for Joint Fires integration. In December 2008, David was posted to RAF Wittering as Chief-of-Staff within the Air Logistics Force Headquarters and Officer Commanding Operations Wing. The latter duty allowed him to temporarily dust off his flying suit and once again instruct on Harriers. Following the demise of the Harrier Force in late 2010, David was seconded to 10 Downing Street as the military advisor to the Prime Minister’s Strategic Communications Team during Operation ELLAMY. As the air campaign over Libya culminated, David then took on the role of Strategy Chief-of-Staff within the Air Staff, coordinating and providing advice to the Assistant Chief of the Air Staff on myriad Air and Defence-related issues. David was promoted in June 2012 and assumed the role of Group Captain Lightning II in the Air Capability department of Headquarters Air Command. During a fascinating 18 months, he worked closely with Royal Navy, US Marine Corps, DE&S, MAA, and other international Air Force and industry colleagues to ensure safe initial operations and the successful realisation of this extraordinary Combat Air programme. In January 2014, he deployed to Afghanistan as the penultimate Operation HERRICK Commanding Officer 904 Expeditionary Air Wing and Commander UK Joint Operating Base Kandahar. As the Senior British Military Officer for over 1000 UK personnel, his responsibilities included provision of vital UK Combat Air and Air Mobility support to coalition operations and preparation for redeployment of RAF Force Elements from Kandahar Airfield by the end of 2014. 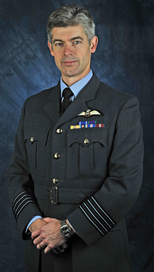 He assumed command of RAF Leeming, North Yorkshire, in December 2014 and has both flying suit and combats at the ready. People power and the internet are being used for the first time by the RAF in a unique project to decide which photograph best represents the Service. 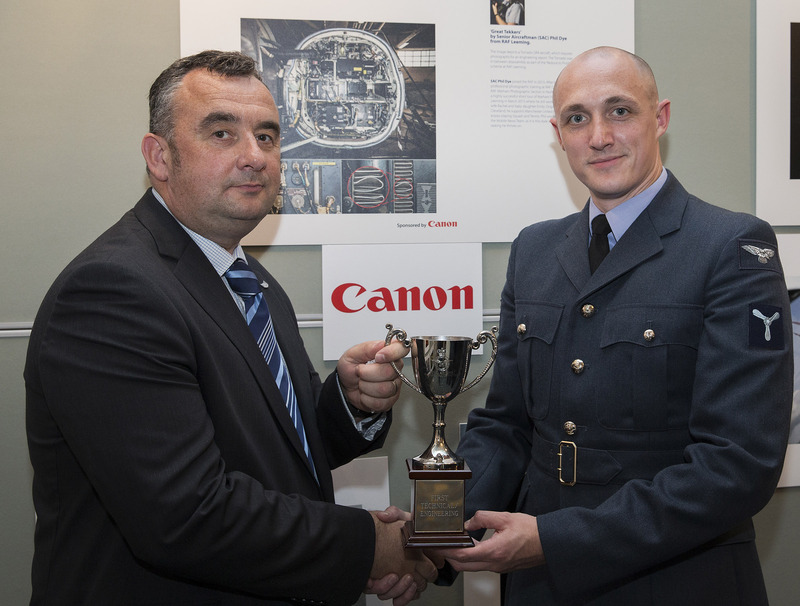 The Photographic Competition judging took place recently at the RAF Museum, Hendon. The judges have selected a shortlist of nine of the top entries and the public can now vote for the image they think best represents the Service. Included in the nine is one by Leeming Sergeant Peter George. People power and the internet are being used for the first time by the RAF in a unique project to decide which photograph best represents the Service. The Photographic Competition judging took place recently at the RAF Museum, Hendon. The judges have selected a shortlist of nine of the top entries and the public can now vote for the image they think best represents the Service. Included is one by Leeming Sgt Peter George. Go to raf.mod.uk/photo-of-the-year-2014 to read about the competitition. Update - Sgt Peter George was awarded second place in the competition as detailed in the article below. 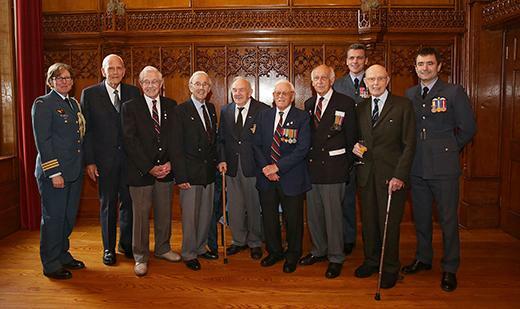 Allerton Castle was the venue for a reunion of WW2 veterans and serving personnel from Leeming and Linton on Ouse who gathered to commemorate its role as HQ of No 6 (Royal Canadian Air Force) Bomber Group from 1 January 1943. During the War Allerton Castle was responsible for all 6 Group airfields and operations in the area. Of almost 56,000 Bomber Command aircrew who died during WWII, some 10,000 were Canadians serving either in RAF or RCAF squadrons. 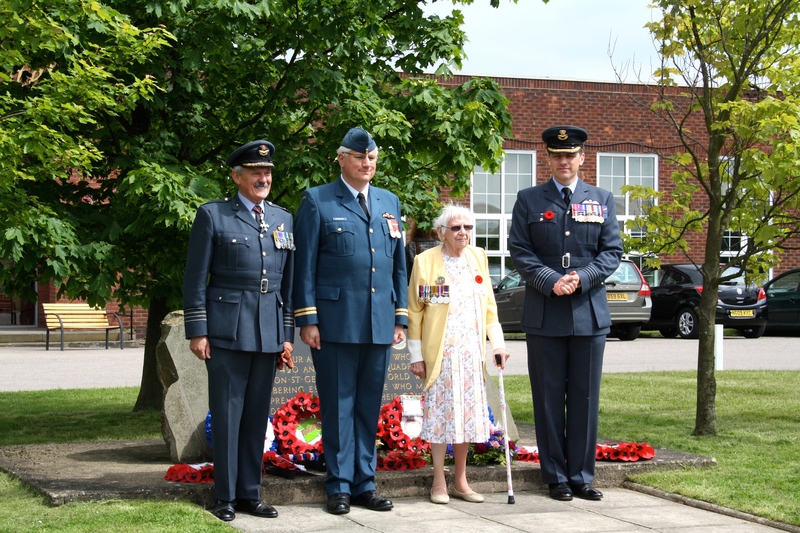 Canadians served all four RAF Commands – Bomber, Fighter, Coastal and Transport Command. Of all gallantry awards to air force personnel 16 per cent were made to RCAF personnel, including two VCs. Veterans and serving officers at Allerton Castle. Group Captain Steve Reeves lays a wreath at the Allerton Memorial. The Gloster Javelin FAW Mk 4 which has served as the gate guardian at Leeming for many years is being offered for sale by the MOD. It is believed to be the only Mk 4 in existence. Hopefully a new gate guardian will take its place at Leeming. The MOD tendering link is here. 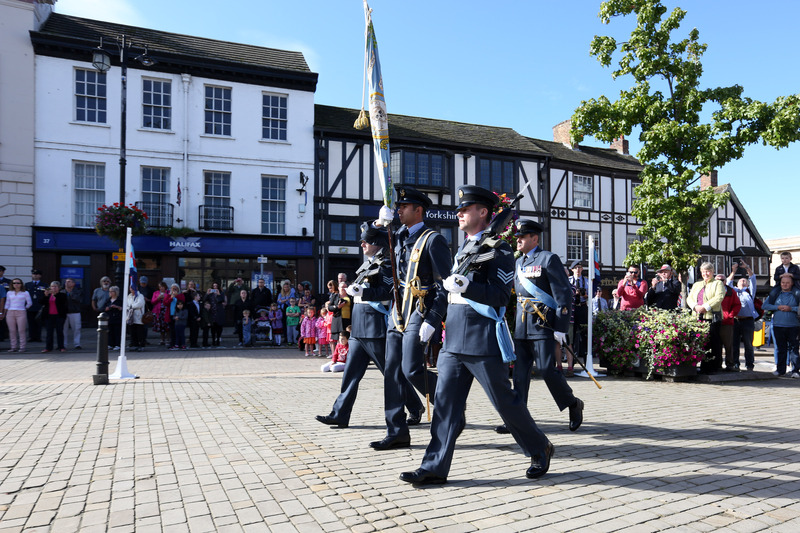 RAF Leeming personnel paraded through Ripon joining forces with the City to commemorate the Battle of Britain on Sunday 14 September. 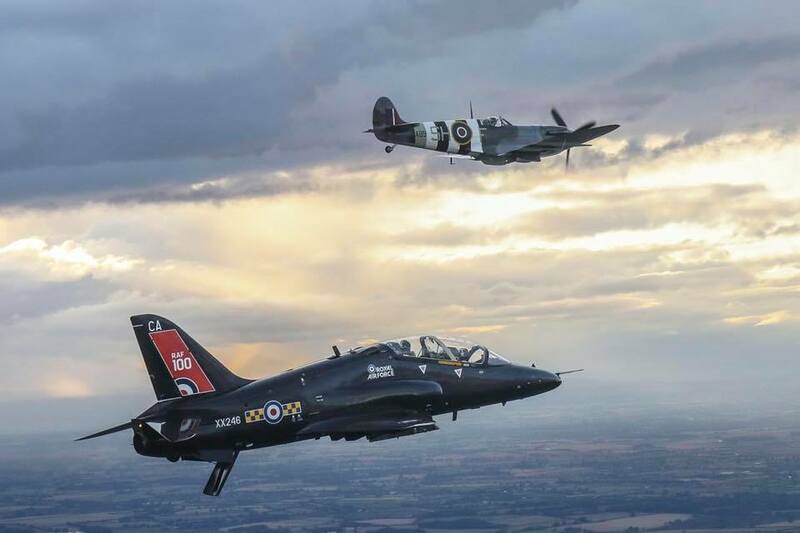 The annual event remembers the heroic efforts of Royal Air Force pilots of fighter command who took on German attacks directed at RAF airfields in the south of England. The Battle for national survival was waged in the skies over Britain in the summer and autumn of 1940. 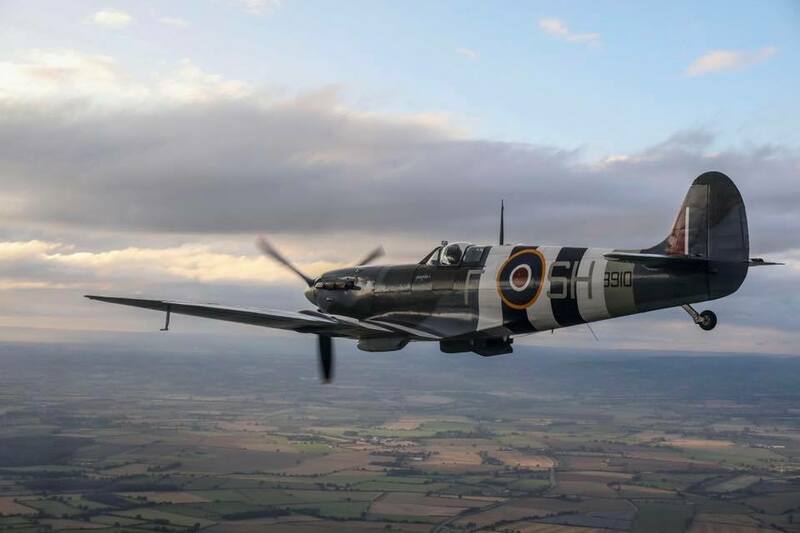 It was the first to be fought primarily in the air, and helped decide the fate not only of the United Kingdom, but also rested the freedom of Europe and the outcome of the Second World War. 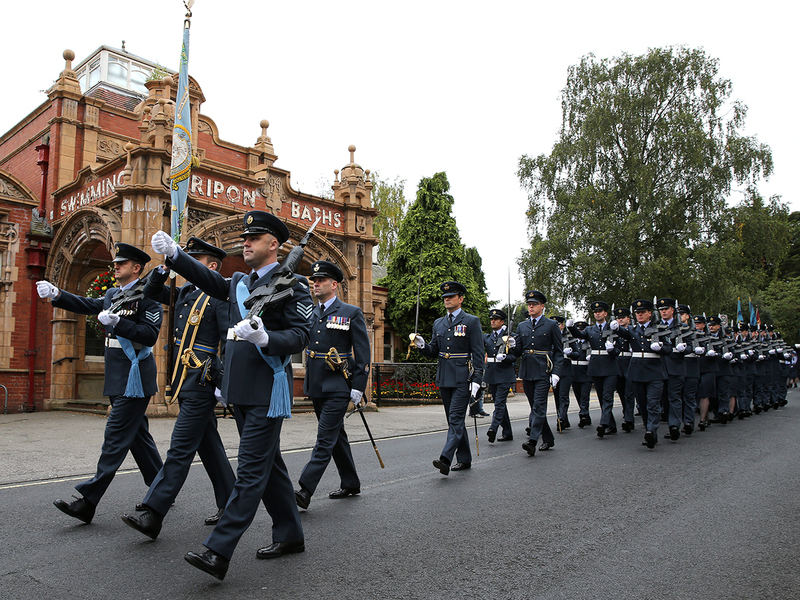 The parade followed a memorial service at the Ripon Spa and marched through the main Market Square to the sound of the Band of the RAF Regiment. 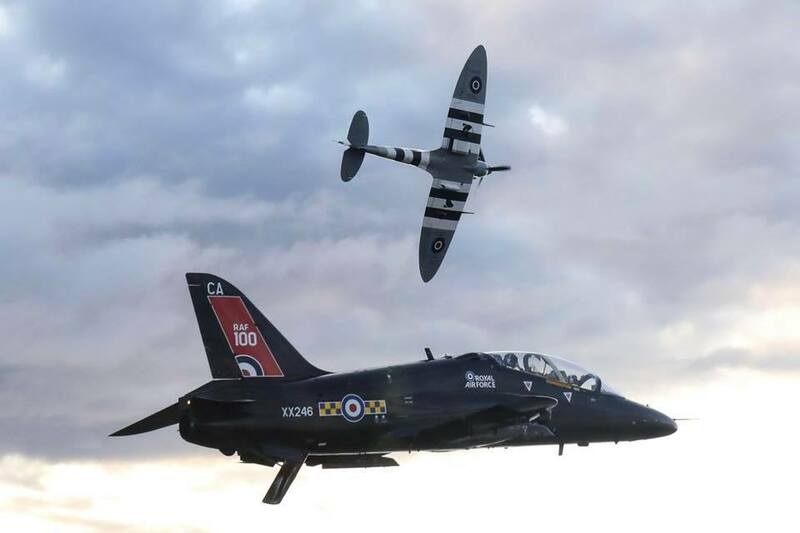 The salute was taken by the Mayor of Ripon, Cllr Mick Stanley and RAF Leeming Station Commander, Group Captain Steve Reeves, to coincide with a flypast by two Hawk jets from 100 Sqn. 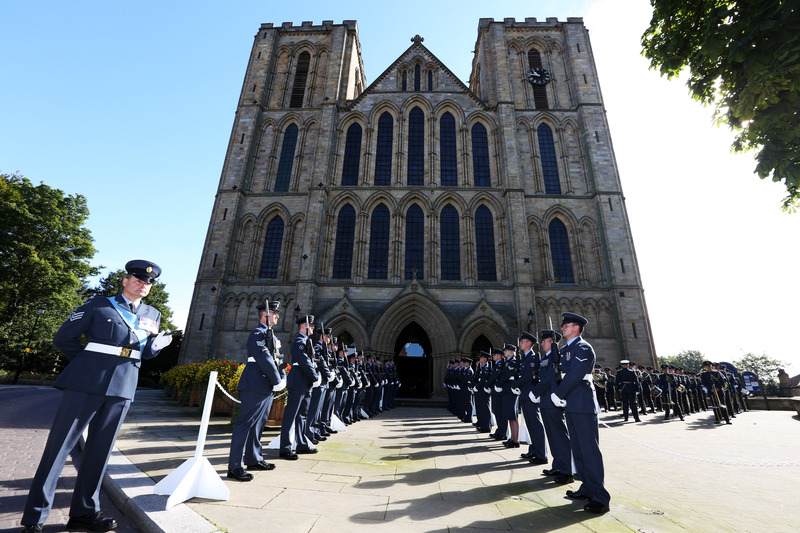 The parade was followed by a service in Ripon Cathedral. 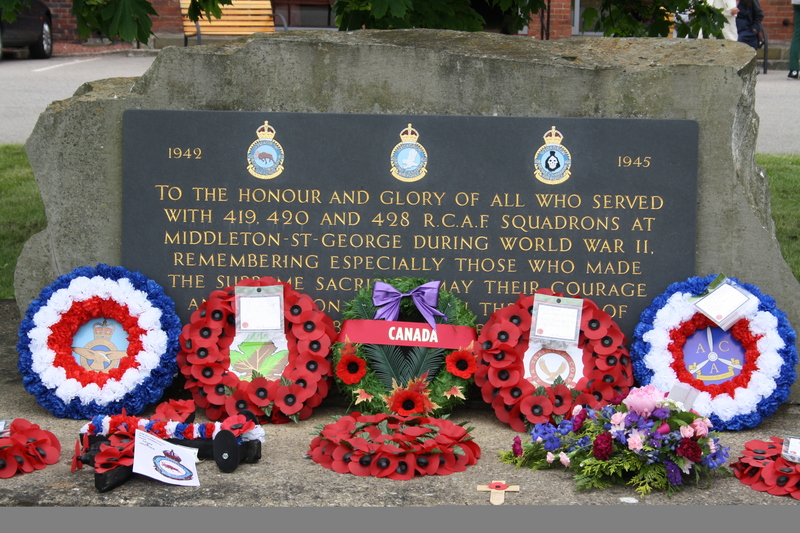 Leeming Station Commander, Group Captain S. E. Reeves, honoured the Canadian wartime airmen who operated from Middleton St George aerodrome between 1942 and 1945 at a Reunion Service organised by the Middleton St George Memorial Association. 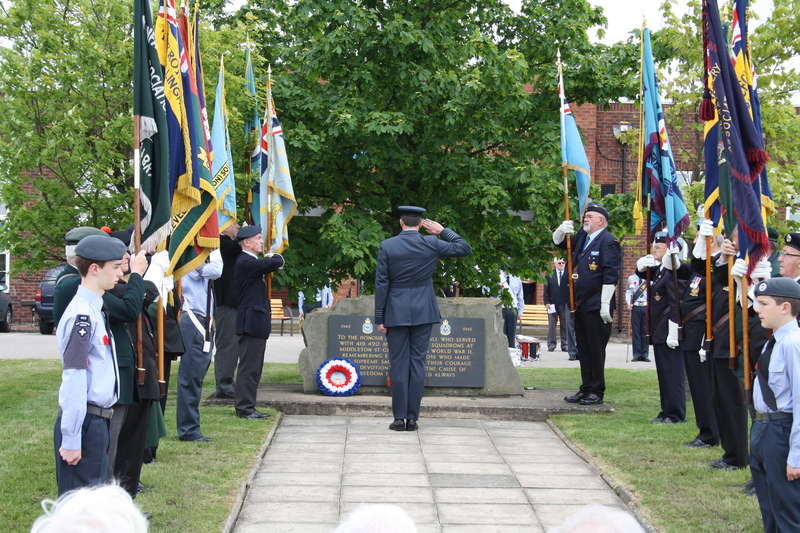 The Memorial Service was held on Saturday 31 May in the RCAF Memorial Garden at the Airport St George Hotel, which was the former Officers Mess at RAF Middleton St George. Wreaths were laid during the Service, which was conducted by The Reverend Colin Lingard and attended by community and service representatives as well as the public. The Service was the focus of events organised over the weekend which included a concert at Darlington Civic Theatre and a Dinner at the St George Hotel. The objective for the A4 Force on Ex BEN HUR was to set up a deployed operating base with sufficient fuel, equipment and supplies. Then, through a series of hypothetical incidents, test its own ability to respond to sudden changes in operational situation and deal with rapid increases in demand for resources. Access to Defence IT systems and connection to secure communications is essential for any deployed operating base. 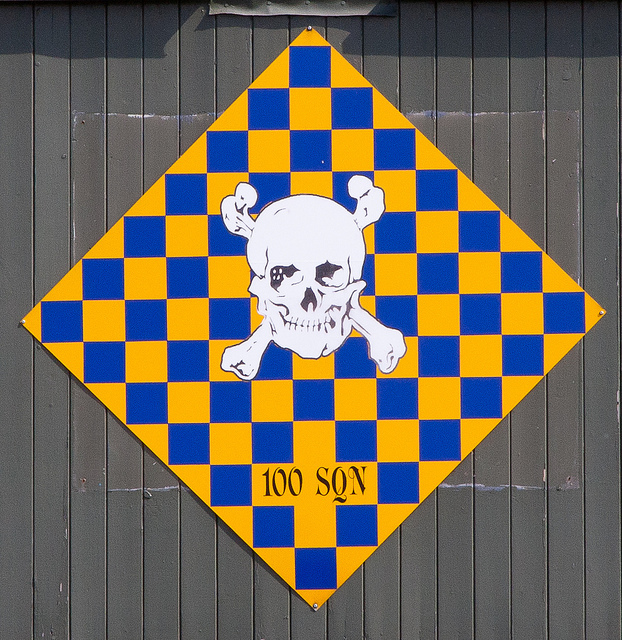 The essence of the tasking for 90 Signals Unit at Ex BEN HUR was to provide enough connectivity, such that the deployed operating base could function effectively. For No 1 Expeditionary Logistics (EL) Squadron, Ex BEN HUR was particularly important. Their initial job was to set up a deployed supply group (DSG), which provides an operating base’s logistics support. At the same time, 1 EL Sqn installed and tested the brand new Joint Operational Fuel System (JOFS) 2 Primary Bulk Fuel Installation. The new fuel storage and pumping equipment will mean more fuel can be stored in deployed locations than was previously possible, as well as allow fuel trucks to be emptied and filled with greater efficiency. The new fuels kit was tested successfully, allowing 1 EL Squadron personnel to begin ‘training the trainers’ on the new equipment. 90 Signals Unit arrived with the state-of-the-art equipment and within a very short timescale had installed internal telephones, secure internet and data systems. Importantly, they had also installed two laptops with MJDI. 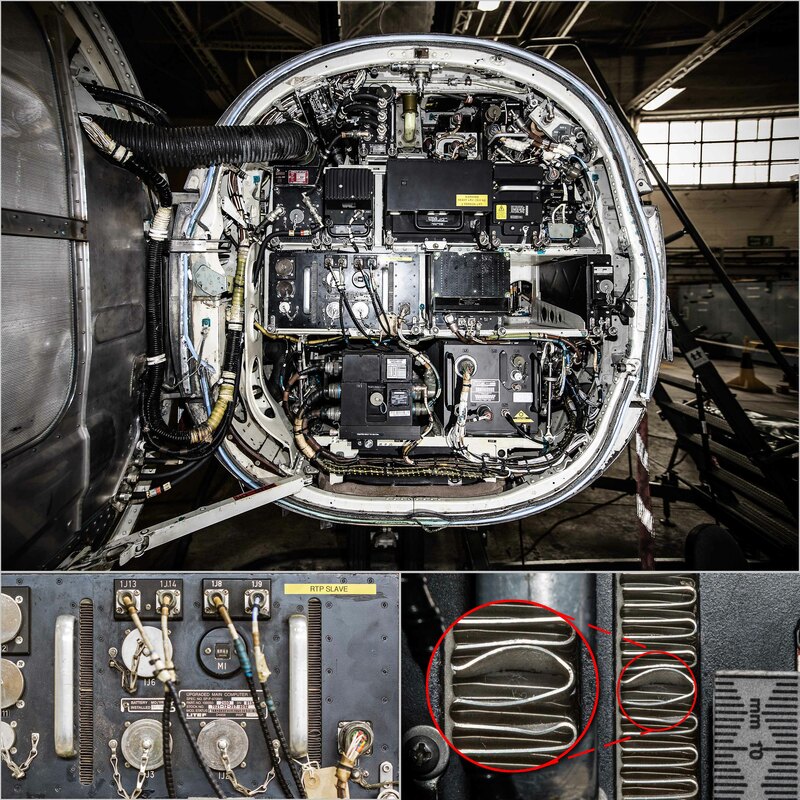 MJDI is an IT system which keeps count of equipment and allows users to demand kit from the depot – essential for keeping an expeditionary air wing properly equipped. The trucks of 2 Mechanical Squadron (2MT) rolled into action, delivering over 30 truckloads of equipment to Barton Stacey, unloaded it, and then, to simulate a nearby port, made daily runs to RAF Brize Norton to fetch supplies and fresh water. But it’s not only trucks; much of the specialist equipment operated by 2MT - including the rough terrain cargo handler (RTCH), heavy crane and heavy low loader - found frequent employment throughout the exercise. The Squadron also provided a much needed intra-site transport capability. Throughout the 10 day duration of the exercise, the A4 Force and 90SU faced a variety of challenging hypothetical situations, including a simulated attack by insurgents, before returning to their base units. As a test, Ex BEN HUR proved very thorough, with many of the A4 Force’s logistics capabilities strenuously tested. The BEN HUR Scenario had an RAF EAW deploying to a foreign air base in support of a UN peacekeeping assignment resulting from the actions of a government of a nearby country having used air power against its own people. Warrant Officer George Vasey MBE knows a thing or two about radar love. After more than 30 years in the Royal Air Force, George retired from 90 Signals Unit in customary fashion for a Warrant Officer. 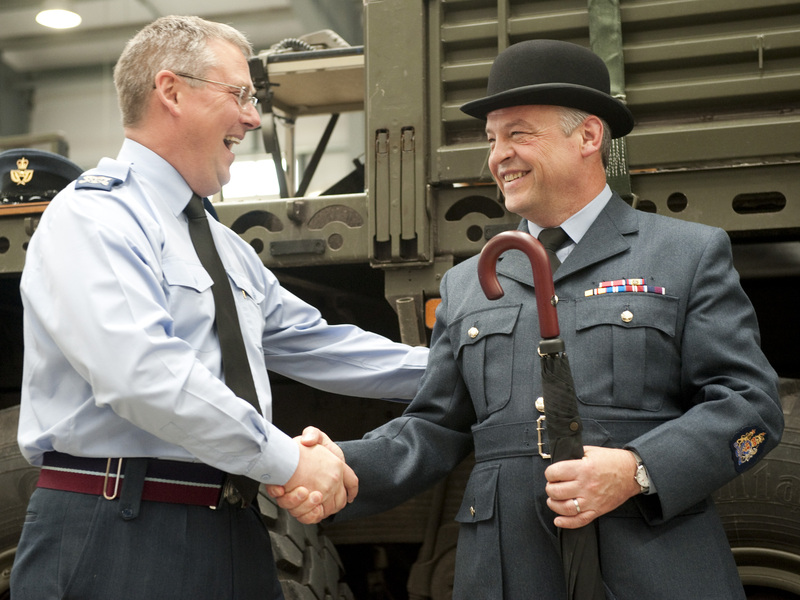 The RAF was 85,000 strong in 1984 when WO Vasey joined up and although the Service is 50,000 people smaller on his retirement, he still loves it. During his career which started as an Electronics Technician (Air Defence) on heavy radars he served at Units in the UK and Europe including RAF Neatishead, RAF Spadeadam, RAF Gatow (Berlin), RAF Henlow, RAF Episkopi (Cyprus), RAF Boulmer and RAF Leeming. 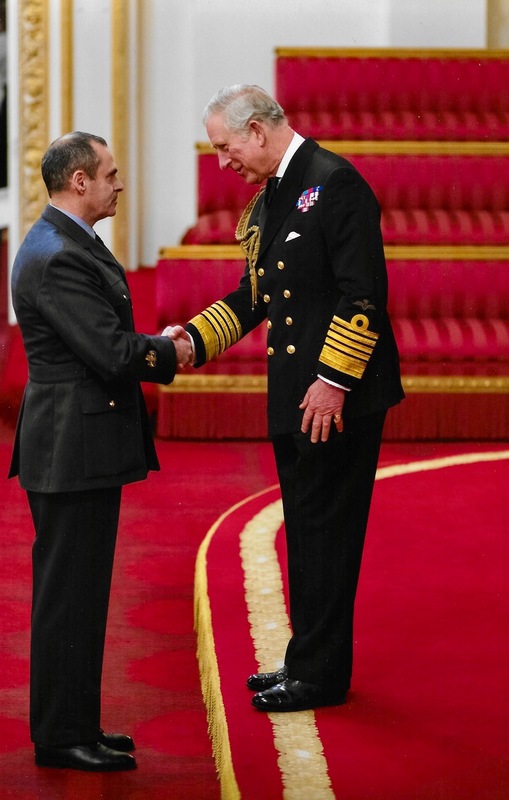 There have also been many highlights with 90 Signals Unit – in particular being awarded the MBE in 2005 for his work at RAF Boulmer, where he built a team of specialists for worldwide deployment and was recognised for his outstanding efforts in deploying to places such as Norway, Oman, Iraq, Kazakhstan and the Outer Hebrides. WO Vasey was based at RAF Gatow when the Berlin Wall came down as was part of Operation GRANBY in the first Gulf War. He was the first non-commissioned member of the RAF to be awarded Incorporate Engineer status with the Institute of Engineering and Technology and even managed to squeeze in becoming a black belt in Karate. George is looking forward to enjoying home life in Blyth, Northumberland with his wife Katy. Photo left - WO Vasey is wished a happy retirement by Group Captain Chris Moore, Commanding Officer 90 Signals Unit. Photo right - WO Paul Blood, Unit Warrant Officer of 90 Signals Unit says farewell to WO Vasey. 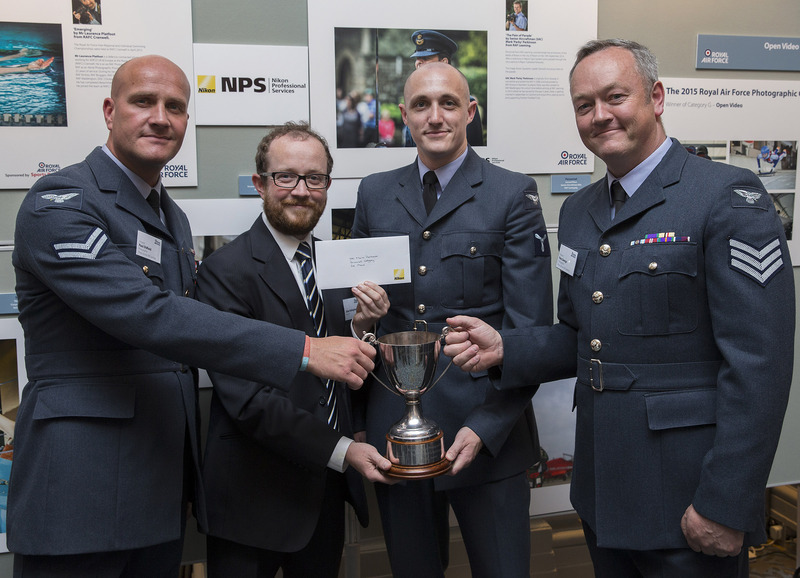 RAF Leeming has been presented with a prestigious trophy after collecting more money for the Royal Air Forces Association Wings Appeal than any other Station. Members of the Royal Air Forces Association (RAFA) Committee from the North Yorkshire Station were presented with the Lord Tedder Trophy by Air Marshall Sir Dusty Miller KBE – President of the Association at the 2014 RAFA Conference in Blackpool, in recognition of more than £12,500 collected on station during 2013. 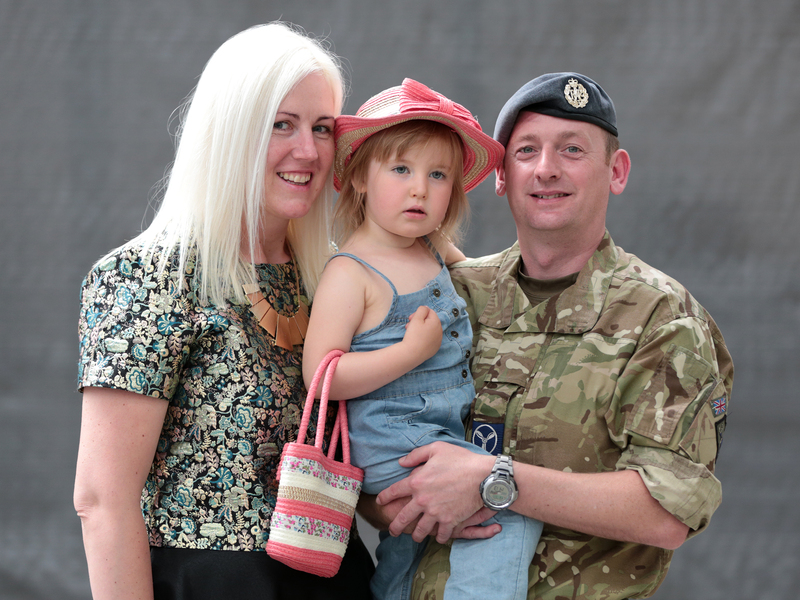 Sergeant Louise Calvert, a member of RAF Leeming’s RAFA Committee, said: “I wanted to do something different and working with RAFA has been very rewarding – I wish I had done it before. The funds were raised through various means on Station, including the income from our Contact Houses, and fundraising events such as a spinathon and RAF Leeming Bake Off. 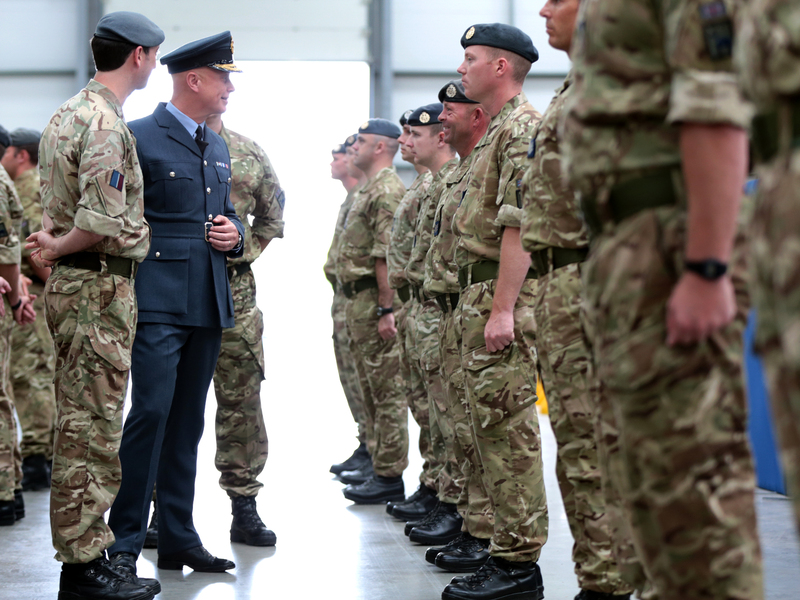 Royal Air Force communications specialists welcomed the Air Commodore Simon Richardson to present their Operational Service Medals after their return from a busy tour in Afghanistan. The members of 3 (Field Communications) Squadron, Tactical Communications Wing, 90 Signals Unit, based at the North Yorkshire airbase, carried out a six-month tour in operational bases all over Afghanistan. 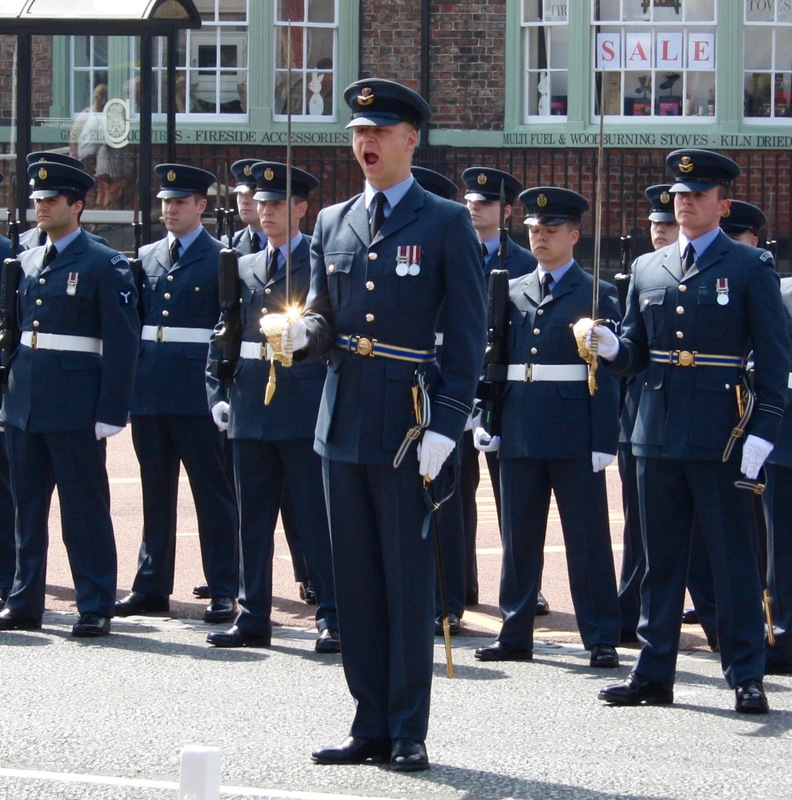 Photos - Personnel from 90 SU are presented with their medals by Air Commodore Simon Richardson. SAC David Morrison with his partner Caroline Clark and their daughter Sadie. Royal Air Force signallers based at RAF Leeming honoured their departed colleagues with their annual service of remembrance at the National Memorial Aboretum in Staffordshire. Family, friends and colleagues stood in silent remembrance as the names of all personnel listed on 90 Signal Unit’s Memorial were read out. The stone, which is one of more than 200 memorials in the United Kingdom’s year-round centre of remembrance, commemorates and celebrate all those who died in the service of 90 Signal Unit. Amongst those gathered was the family of Corporal Davey Jones, who died in 2010 aged 31. The memorial service was attended by his widow Sarah, with their youngest son Luke, his parents Brian and Doris and his sister Bethan. All were touched that David was being honoured by the Royal Air Force which had meant so much to him. Sarah, who is serving as a sergeant in the Army said: “The RAF was very important to Davey, he loved it. There was always a bit of banter between us about who would be promoted to sergeant first!” Mr Jones added: “He’d have gone into space to beat Sarah to sergeant! Above - Group Captain Chris Moore, C. O. 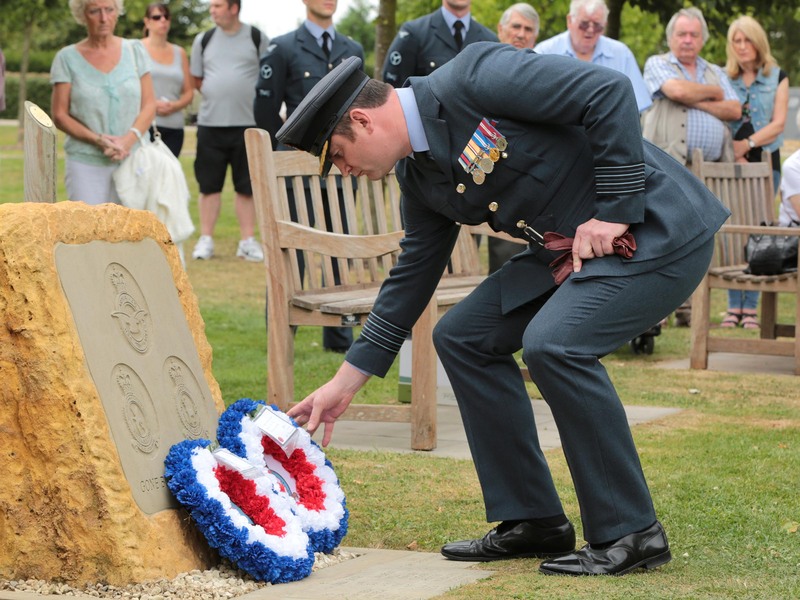 90 S.U., lays a wreath at the National Memorial Arboretum. 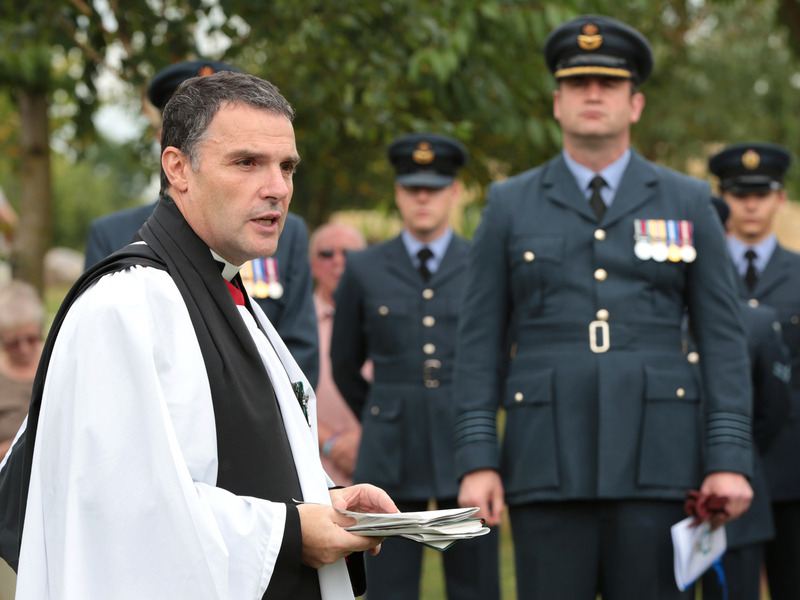 Below - Sqn Ldr Stewart Shaw, RAF Leeming Padre, addresses personnel at the annual memorial service for 90 S.U. The skies over North Yorkshire have been buzzing with life as military personnel landed at RAF Leeming to take part in the flying phase of a Helicopter Tactics Instructors Course, Exercise Hawkowl. 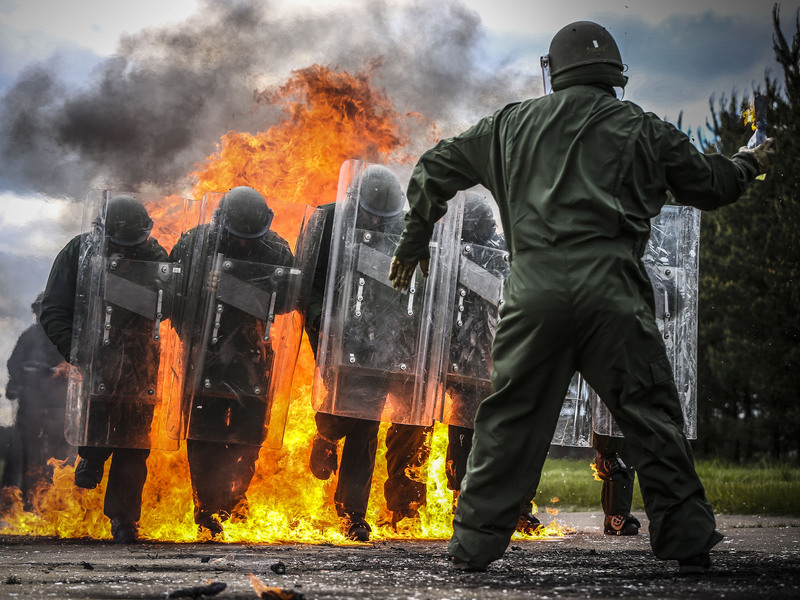 The course takes on experienced personnel from various military helicopter fleets including Lynx, Puma, Chinook and Merlin and teaches them advanced tactics in fighting against fast jets, electronic warfare systems and other potential challenges. Personnel from the United States Air Force, Royal Australian Air Force and Czech Air Force are also involved with the exercise. 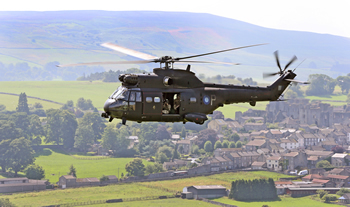 The location of RAF Leeming makes it a perfect for hosting an exercise of this type, with easy access to military training areas such as Spadeadam and Otterburn as well airspace over the North Sea. 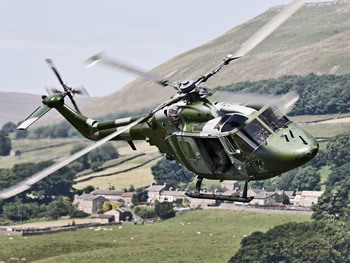 The skies of North Yorkshire were home to the assets participating in Exercise Hawkowl including Lynx and Puma as shown in the accompanying photos. 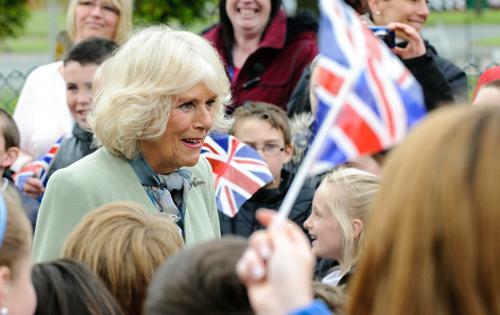 RAF Leeming's Hon Air Commodore, HRH Duchess of Cornwall, visited the station to officially open the new Medical Centre on Wednesday 9 May 2014. 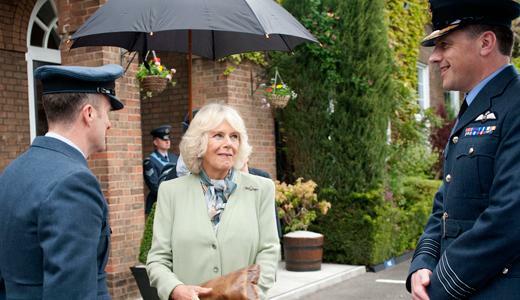 She is seen being welcomed by the station commander, Group Captain Reeves. The former Station Medical Centre at Royal Air Force Leeming was a war-time facility dating back to the original build in 1939. Since then, the Station has been through numerous incarnations from WWII bomber base to flying training and fast-jet base. Today, Defence Medical Services through the Medical Centre team meets the needs of 2,800 patients. Construction on the £4.9 million building started in August 2012 and was completed in March this year. The building enables the team of highly dedicated staff to treat patients in a centre which has been specifically designed to meet the needs of Royal Air Force Leeming’s diverse population. 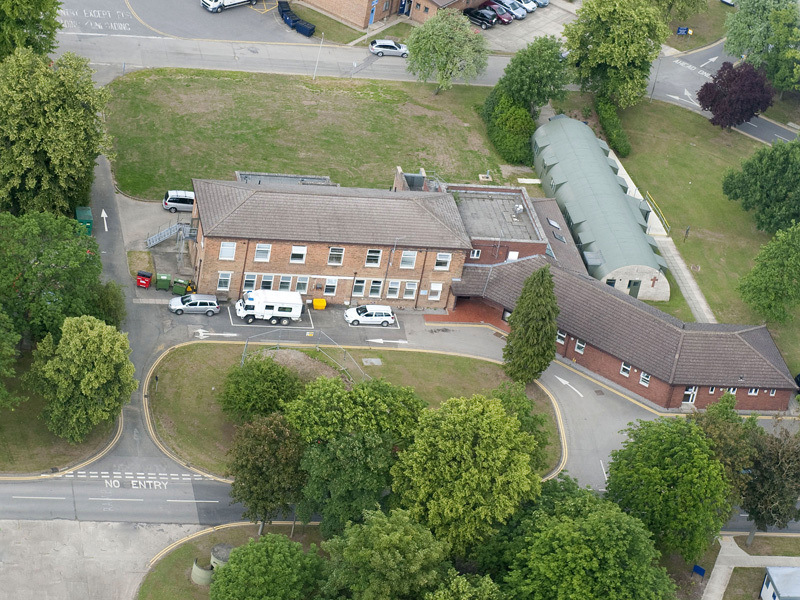 The Station Medical Centre provides emergency medical cover to the military activities of Royal Air Force Leeming during working hours and extended hours during exercise periods. There is an Emergency Response room specifically designed to deal with casualties until they can be stabilised and moved to a larger medical establishment. Unlike most military Medical Centres, the Centre also caters for more than 800 dependents. The Centre also houses a compact gymnasium configured to meet specific or broad rehabilitation needs including a full range of cases from minor sports injuries to more serious traumas incurred as a result of operational duty. Our FLAG Deputy OIC Flt. 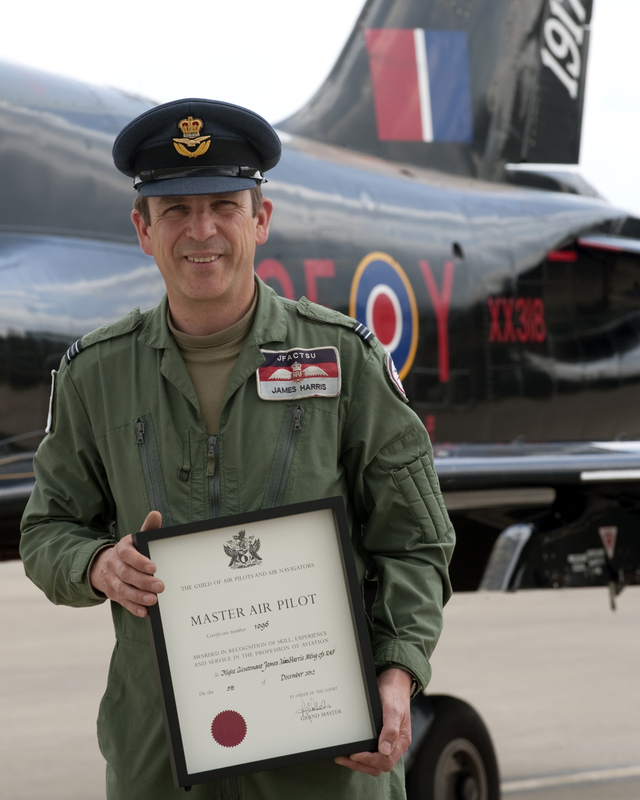 Lt.James Harris, a pilot with JFACTSU has been presented with one of the top awards of a lifetime for bringing honour and respect to his profession during a flying career of more than 20 years. James was awarded with the Master Air Pilot Certificate during a gala dinner held in London by the Guild of Air Pilots and Air Navigators. The award is given to a very small number of people each year, and is in recognition of long service and consistently high standards in one or more branches of professional flying, whether civil or military. As the title suggests, the recipient will be a proven Master of his craft. 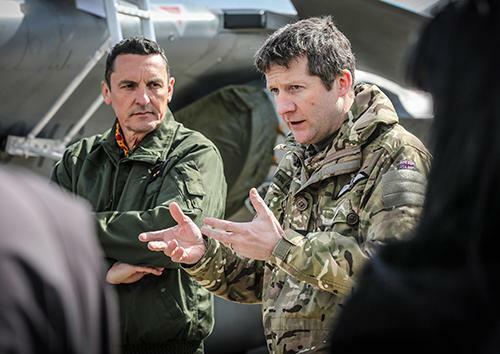 Much of James’s career has been spent on instructional roles, and he currently serves with the Joint Forward Air Control Training and Standards Unit – helping to train personnel from all three services in a role which is vital to current operational needs. FLAG members visited RAF Leeming during Exercise Capable Eagle during which they had an opportunity to get close up to the Typhoons. 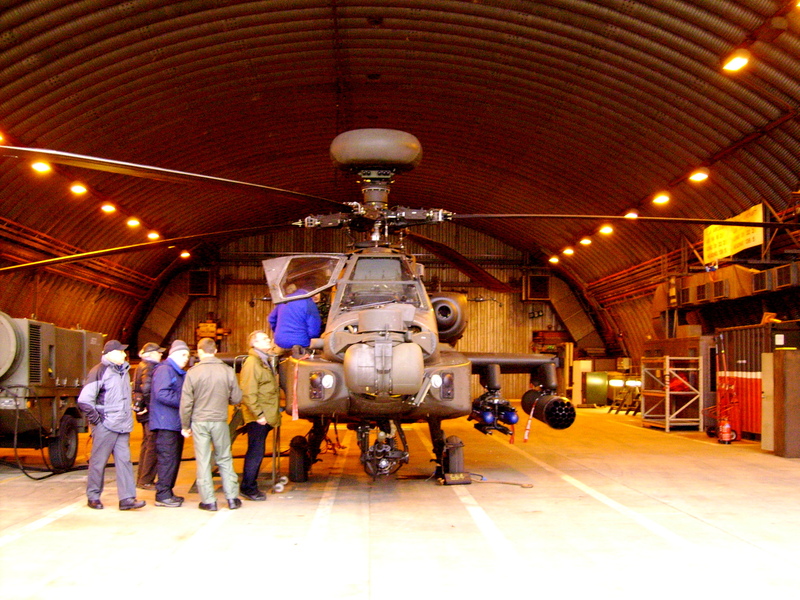 Given its location RAF Leeming often hosts visiting units from both the RAF and the Army Air Corps. The latter's Apache attack helicoptors are frequent visitors while on training or exercises using the northern ranges. 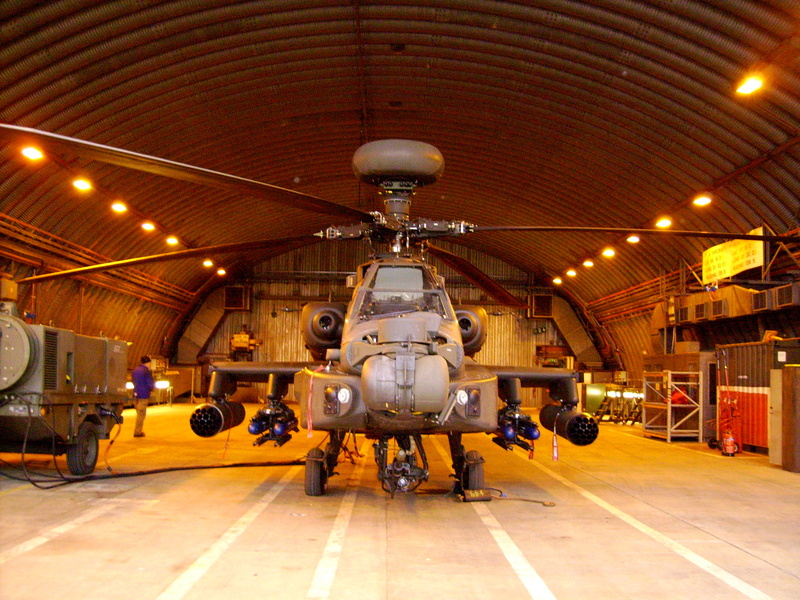 These photos by member Linda Hornby were taken during a FLAG visit to one such Apache deployment to Leeming. RAF Leeming has a proud and distinguished past which is displayed and celebrated in The Historic Training Facility (HTF) which was opened on 3rd June 2010 to coincide with the Station’s 70th birthday. It was set up by Flt Lt Alfie Hall and is used to engage with many different organisations in the local Community. The facility is located behind the old Medical Centre and is distinctive by its Nissen Hut shape. Those with a keen eye will notice the Cross on the end of the building which gives a clue to its previous use. The former station church is an ideal way in which to engage with the community and to illustrate the Station’s history in a meaningful way. The facility is designed to present a pictorial and vivid timeline of the Station’s history and how it has changed roles since it first opened as a viable RAF Station on 3rd June 1940. Part of 6 Group Bomber Command, the unit has held a number roles throughout its busy history and has strong links with the Royal Canadian Air Force. Now managed by WO Derek McDonough, the facility hosts a number of programmed visits and is enjoyed by a wide cross-section of organisations ranging from local schools and colleges, Air Cadet Squadrons, up to the Royal British Legion, to name only a few. The Historic Training Facility is open throughout the year and is also proud to have strong links with the Friends of Leeming Aviation Group who make regular visits to the Station. FLAG hopes to bring the Station's proud history and the role of the HTF to a wider public through our website and would like to thank WO Derek McDonough for his enthusiasm and assistance in doing so. The German Battleship “Tirpitz” was a constant threat to Allied shipping and was tying down precious Royal Navy assets just by the possibility that she could dash from her berth in Norway into the Atlantic. Because her location was deep inside a Norwegian fjord, protected by other ships, anti-torpedo nets, and shore-based installations, any attack from land or sea was impossible. The RAF was therefore tasked to attack the battleship in 1942, even though no suitable airborne weapon existed to attack such a large vessel with. It was well known that Tirpitz had steel armour to protect vulnerable areas, in some places well over 30cms thick, as well as shore-based facilities designed to obscure the ship with smoke while combined air and land anti-aircraft batteries generated considerable firepower. Nevertheless, RAF Halifax and Lancaster Squadrons were tasked to attack the ship with Lancasters dropping bombs on the defensive batteries while the Halifaxes attacked at low level with a converted sea-mine which was adapted so that it would roll down the side of the fjord and detonate underneath the ship, it’s weakest point. The first attack, in January 1942, was disrupted by bad weather over the target area and another in March resulted in heavy losses so further raids were set for the end of April. Halifaxes from 10 Squadron based at RAF Leeming flew with other units on these raids. After long distance flights at night and over the featureless North Sea, the aircraft attacked up Faettenfjord. In addition to the man-made hazards, the geography of the area means that the aircraft were flying up a funnel formed by the sides of the fjord, narrowing as they approached the target and at heights well below the terrain on either side. As a result, the crews report seeing anti-aircraft fire actually being fired down at them and several aircraft were hit. Among these was that of Wg Cdr Don Bennett, OC 10 Squadron who cleared the target area long enough for his crew to bale out before escaping himself. Just over 70 year later, Sqn Ldr Jeff Metcalfe and Flt Lt Alfie Hall visited the area, starting with the Memorial of these raids at Faettenfjord and ending at the crash site of Wg Cdr Bennett’s Halifax near Flornesvollen to understand more about these events and lay wreaths to the 66 airmen who died in these raids. Our guides for this visit are a team of historians from Norway and England who have conducted extensive research into these raids. Linzee Druce, Kjell Sørenson and Morten Moe have explored the whole Country and beyond to transform the recorded facts of air operations into the human stories of those involved. They told us the full story of Halifax W1041, just one of the Leeming aircraft taking part on the night 27/28 April 1942. The most obvious thing about Faettenfjord is how it tapers and the approach is not straight either and is obstructed by a small island on which were yet more anti-aircraft guns. To be able to see the target at night, the Halifaxes attacked at around 100 feet, well below the height of the cliffs on both sides. The best way to imagine it is like the approach to the Ruhr Valley Dams as filmed for the classic film “The Dambusters” except that this target was extremely well defended and covered in smoke. Even in the daylight of a sunny day when we visited, it is almost impossible to imagine how the aircraft managed to attack at all. Struck by flak on this approach, Wg Cdr Bennett tried to gain height and headed for the Swedish border but it was impossible and all baled out with the aircraft crashing shortly afterwards. As we walked up to the site, the terrain makes walking around the area very difficult even with modern walking gear. But it is well worth the effort as the crash could have happened only yesterday. Wreckage is clearly identifiable across the site, most significant is a complete Merlin engine. Exploring the area we found the remains of the aircraft bomb racks and, although they are twisted from the impact, you can still see the hand-made adaptations that the groundcrew had made to try and accommodate the new weapons. During the Second World War, RAF Leeming lost 283 aircraft and here is one of them. When the crew landed in 1942, they would have found snow up to their waist and pitch darkness, despite which Wg Cdr Bennett walked all the way to Sweden from where he was eventually repatriated to the UK, in fact he was back in command of his Squadron only 5 months after being shot down and went on to be a founder of the famed Pathfinder Force. The 1942 attacks on Tirpitz did not damage the ship and it was not until 1944 that she was eventually sunk by air attack. However, these early raids did severely limit the German High Command freedom to manoeuvre, showing that no target was truly safe from air attack. 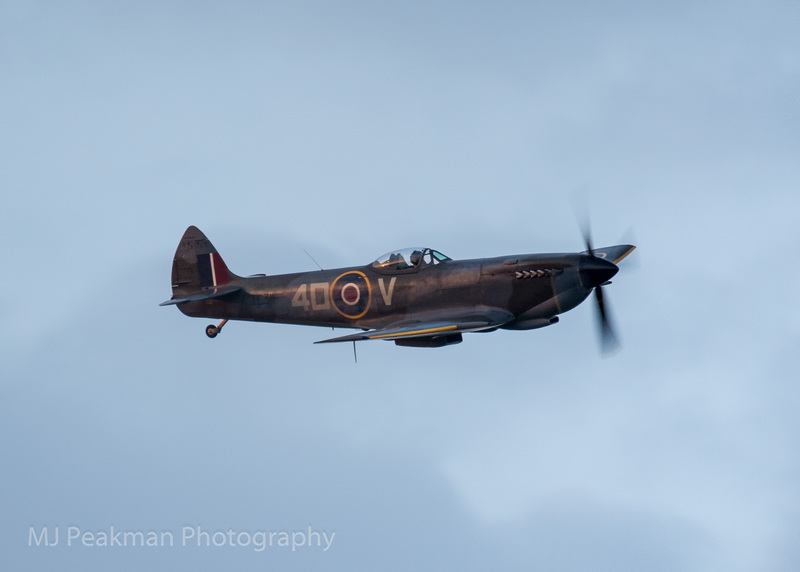 The flying skills of the crews in 1942, flying at such low level, with an untried weapon, at night and under constant attack is worthy of acknowledgement and provides any student of Air Power with food for thought. Representative of the 10 Sqn Halifax flown by Wg Cdr Bennett in the Tirpitz raid is the Yorkshire Air Museum's Halifax II (III) reconstruction on display at Elvington. 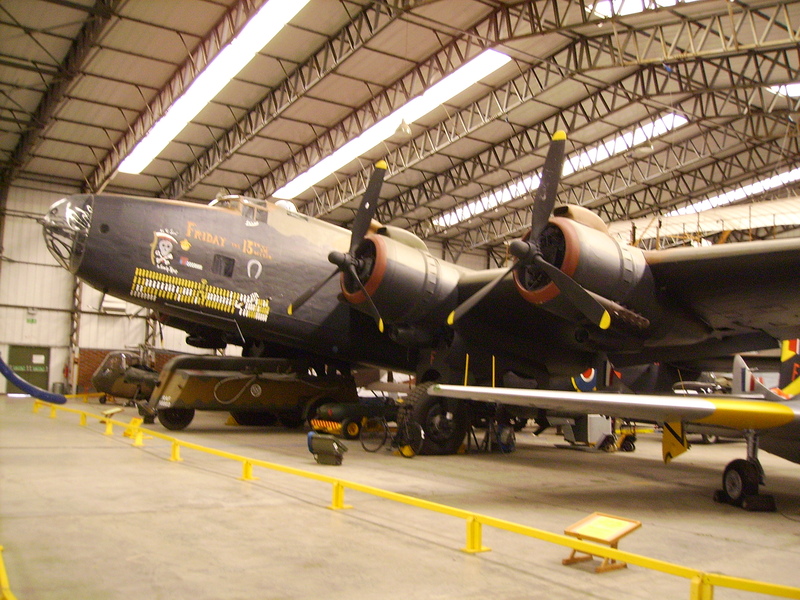 The photo by Linda Hornby was taken during a FLAG guided tour which included access to the interior of the Halifax.